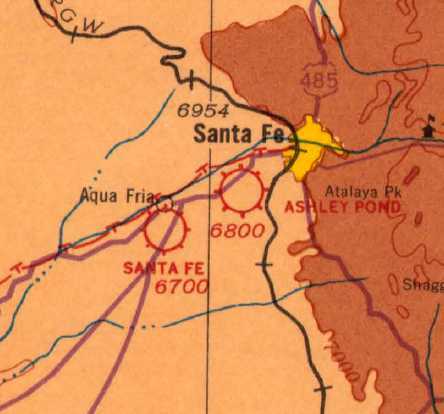 Zuni Airport, as depicted on the 1969 Sectional Chart (courtesy of Fred DeGuio). 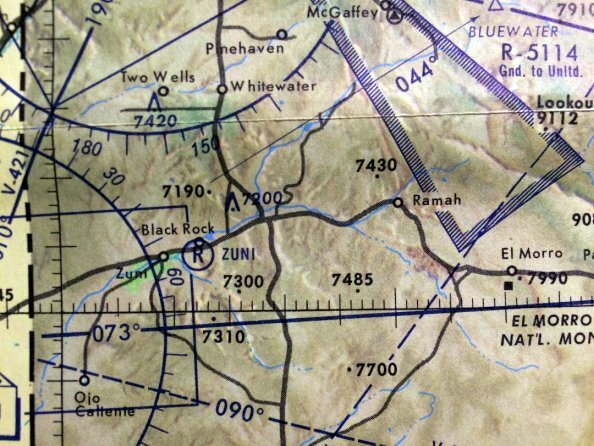 This airport is located within the Zuni Reservation in western New Mexico. The date of establishment of Zuni Airport has not been determined. 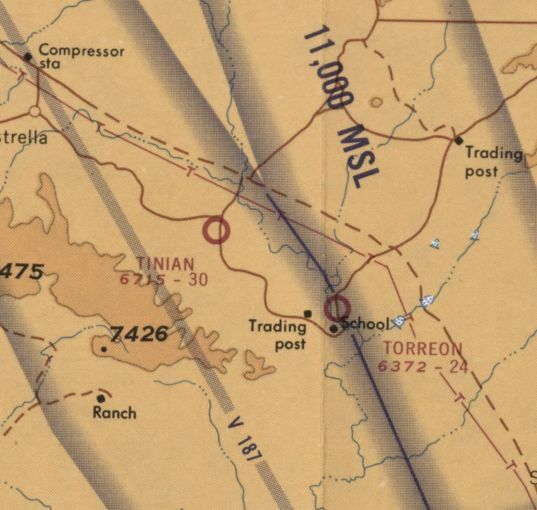 The earliest depiction which has been located of Zuni Airport was on the 1969 Sectional Chart (courtesy of Fred DeGuio). It depicted Zuni as a private airfield with an unpaved runway. as that is how it was labeled on the 1971 Sectional Chart (courtesy of Fred DeGuio). 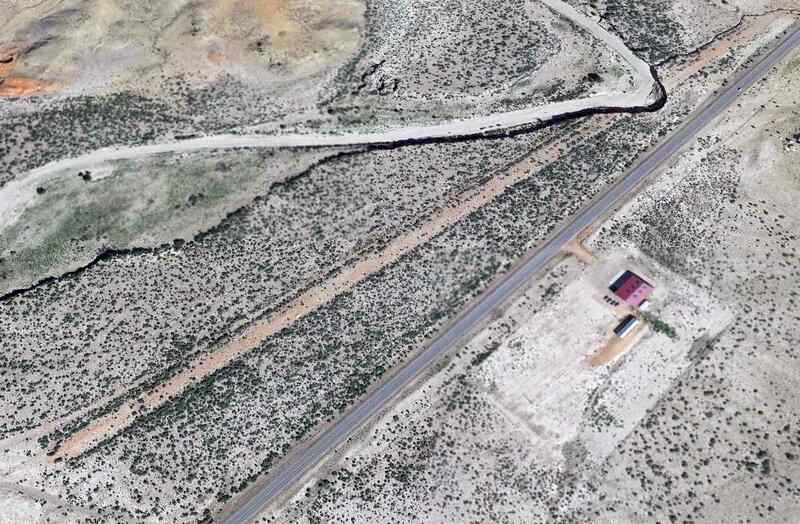 Black Rock Airport's runway had also been improved, to a 4,800' paved southwest/northeast strip. 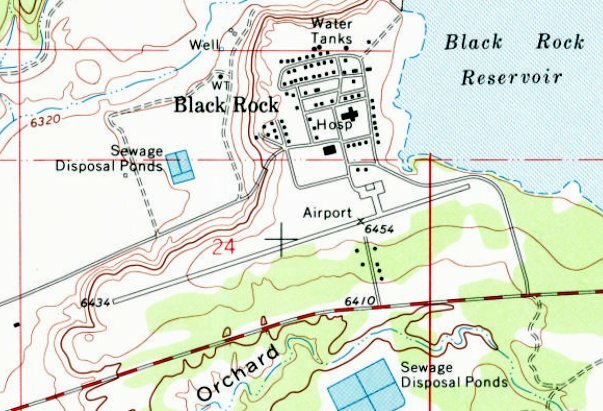 The earliest topo map depiction which has been located of Black Rock Airport was on the 1972 USGS topo map. with a taxiway leading to a ramp & a building on the northeast side. The last aeronautical chart depiction which has been located of Black Rock Airport was on the 1978 Sectional Chart (courtesy of Fred DeGuio). It was depicted as having a beacon, and offering services. 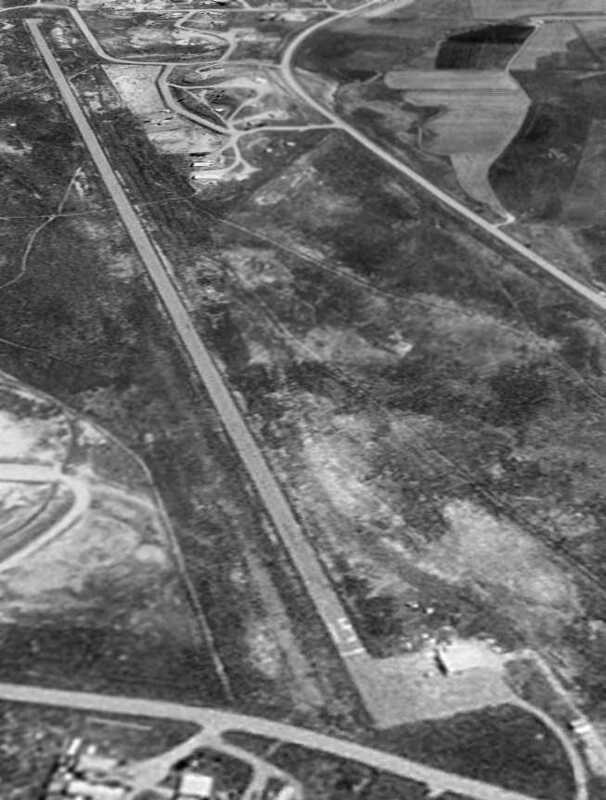 The earliest photo which has been located of Black Rock Airport was a 1991 aerial view looking northwest. It depicted a single paved southwest/northeast runway, with a taxiway leading to a ramp & a building on the northeast side. An 11/10/09 photo of a sign describing Black Rock Airport's Runway 6/24 rehabilitation. An 11/12/09 photo looking northeast at Black Rock Airport's Runway 24 numbers showing its newly repaved surface. A 2016 aerial view looking northwest depicted Black Rock Airport in an unchanged manner, with a single paved southwest/northeast runway, and a taxiway leading to a ramp & a building on the northeast side. 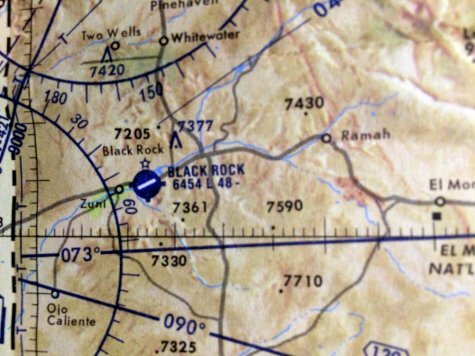 According to Ryan Miller, on 11/7/17 NOTAM 11/067 indicated Black Rock Airport was closed to all aircraft except medevac flights. On 12/11/17, NOAM 12/079 then indicated it was further restricted only to medevac helicopters. Then on 2/12/18, Black Rock Airport finally closed to all traffic. A 4/18/18 aerial view by Fred DeGuio looking south at Black Rock Airport, showing closed-runway “X” symbols painted on both runway ends. The airport otherwise appears intact. Black Rock Airport is located at the southern terminus of B Avenue. Thanks to Fred DeGuio for pointing out this airfield. 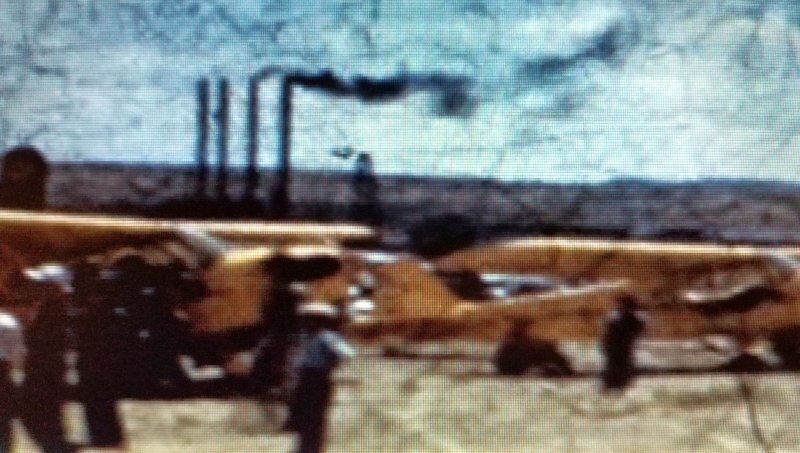 A still from a September 1940 movie by James Bickle of a delivery flight of several new Piper Cubs, in front of the hangars of the original Gallup Airport (courtesy of Bill Bickel, via Dan Rhinehart). 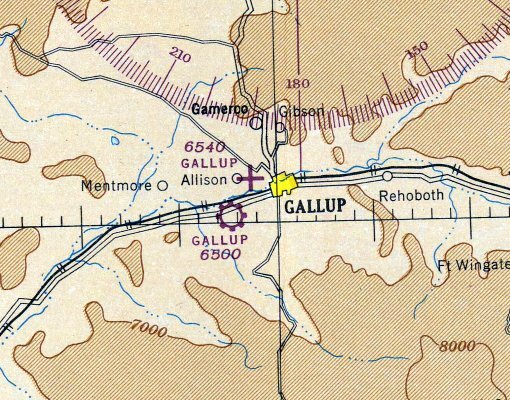 The original airport for the town of Gallup were located to the northwest, just east of Allison. The date of establishment of the original Gallup Airport has not been determined. 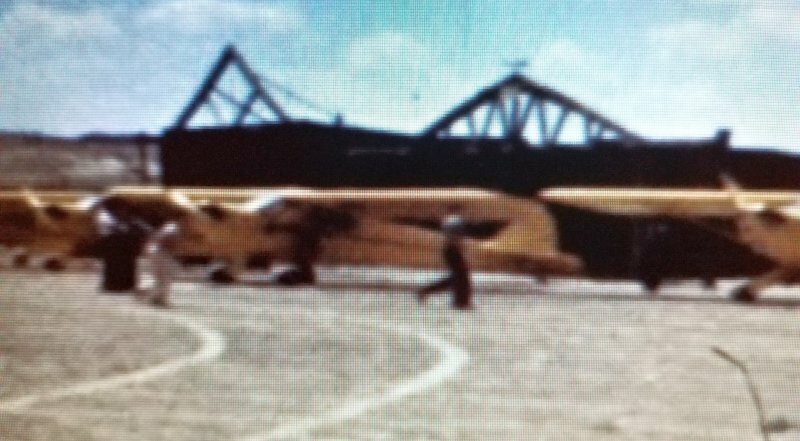 was a September 1940 movie by James Bickle of a delivery flight of several new Piper Cubs (courtesy of Bill Bickel, via Dan Rhinehart). 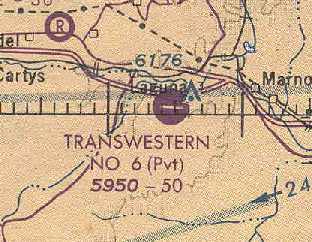 The only aeronautical chart depiction which has been located of the original Gallup Airport was on the May 1945 Prescott Sectional Chart. along with the replacement Gallup Airport to the southwest. 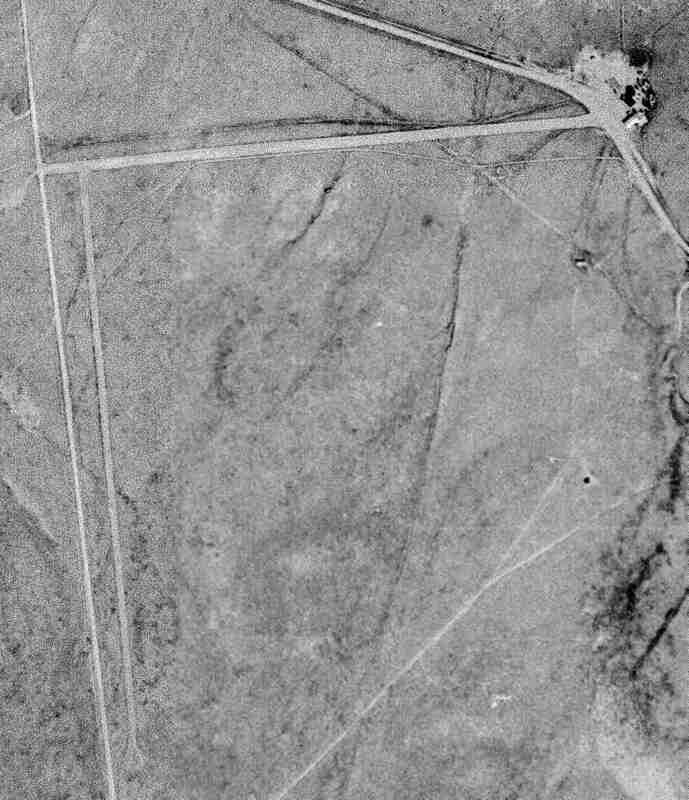 as a 1952 aerial photo showed what appeared to be the remains of an unpaved northeast/southwest runway, surrounded by a large oval track. A 1962 aerial view showed the remains in an unchanged fashion. 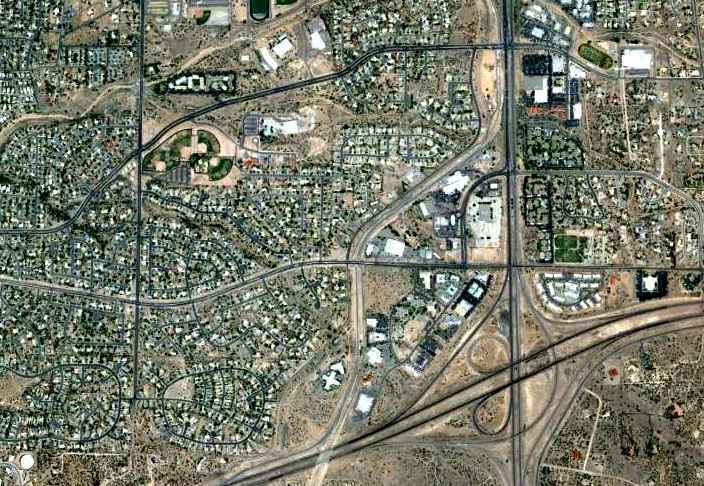 A 1997 aerial view showed the Rio West shopping mall had been built on the site, erasing any trace of the original Gallup Airport. 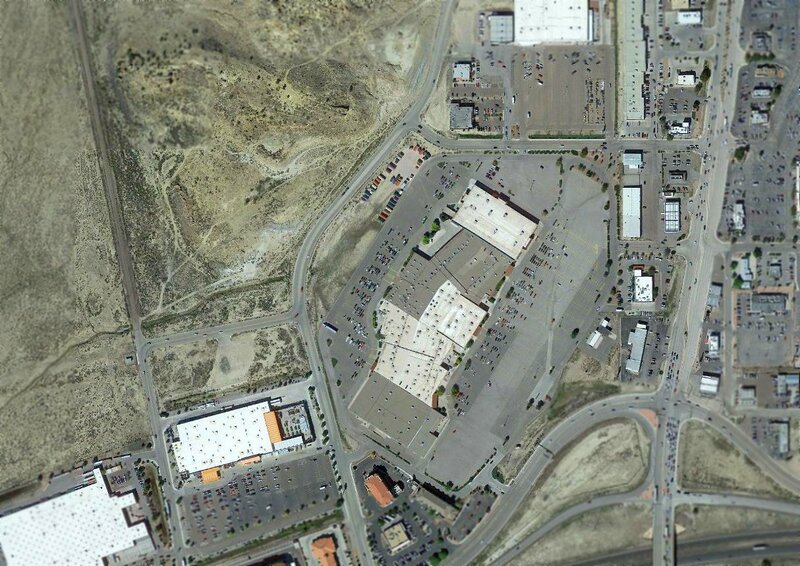 A 2016 aerial view showed the Rio West shopping center covering the site of the original Gallup Airport. The site of the original Gallup Airport is located at the intersection of West Jefferson Avenue & Morello Avenue. Thanks to Dan Rhinehart for pointing out this airfield. 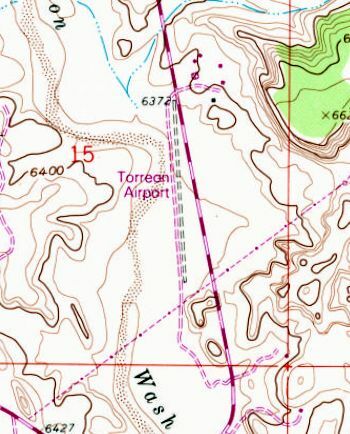 Tinian Airport, as depicted on the 1961 USGS topo map. 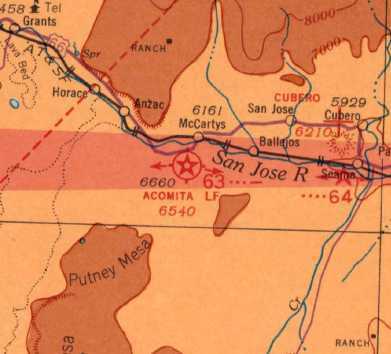 Tinian Airport was not yet depicted on the March 1960 Albuquerque Sectional Chart. The earliest depiction which has been located of Tinian Airport was on the 1961 USGS topo map. with the few small buildings of Tininan Mission across the road to the east. The earliest aeronautical chart depiction which has been located of Tinian Airport was on the December 1964 Sectional Chart (according to Matt Franklin). The earliest aeronautical chart depiction which is available of Tinian Airport was on the May 1967 Sectional Chart (courtesy of Matt Franklin). It depicted Tinian Airport as having a 3,000' unpaved runway. 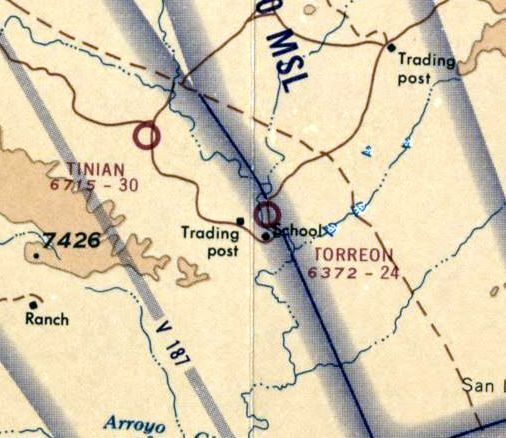 The last aeronautical chart depiction which has been located of Tinian Airport was on the February 1968 Albuquerque Sectional Chart. 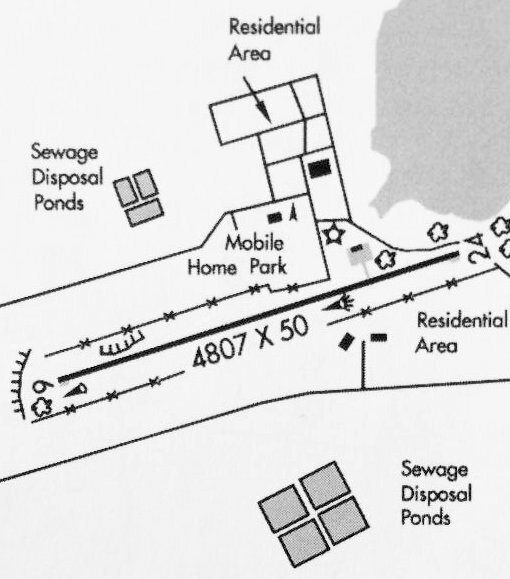 The 1989 USGS topo map depicted Tinian Airport in the same fashion as the 1961 topo map. Tinian Airport was not depicted on the 1990-91 NM Aeronautical Chart (courtesy of Alex Hauzer). 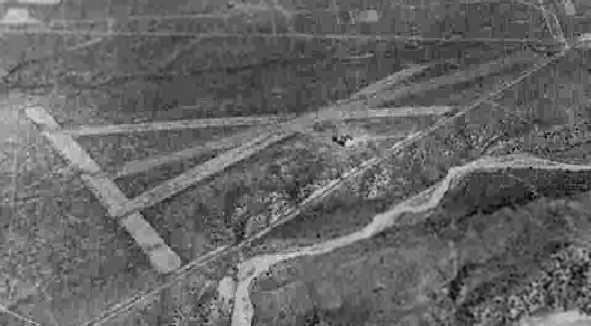 The earliest photo which has been located of Tinian Airport was a 1997 USGS aerial view looking northwest. 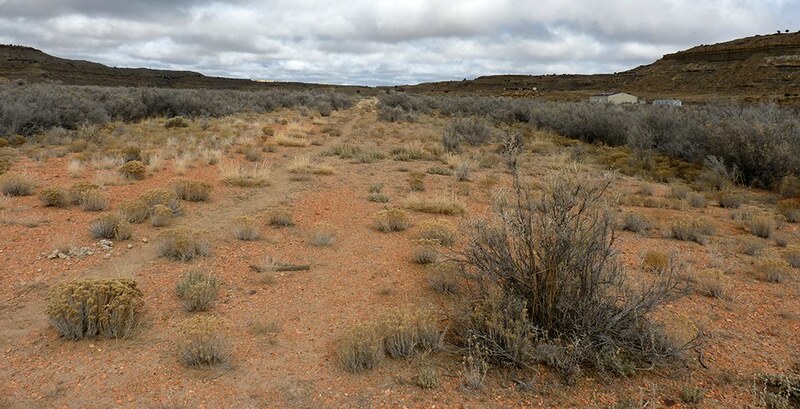 It depicted a single northeast/southwest unpaved runway. A 2014 aerial aerial view looking northwest showed the Tinian runway remaining recognizable but deteriorated. A 2014 photo by Matt Franklin looking along the remains of the Tinian Airport runway. Matt reported, “Tinian was another mission, but as far as I know it’s been erased from the map except for the roads that led to it. The road pictured that clips the northwest corner of the runway was passable for a quarter of a mile & then turned to into a wash basin. I was driving my dad’s Subaru Outback, and I didn’t feel like explaining where I was after high centering the car. All the more reason to buy a Ford Raptor. I walked the remainder of the way to discover nothing of any real consequence. The land is pretty flat so there was nothing to distinguish the runway, and the brush was even. The site of Tinian Airport is located northeast of the intersection of Tininan Road & Route 197. Torreon Airport, as depicted on the 1961 USGS topo map. 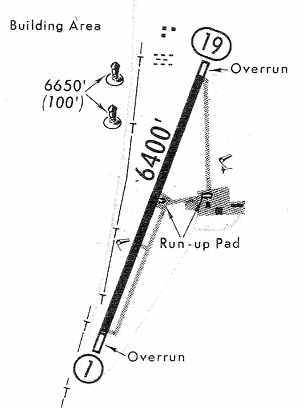 Torreon Airport was not yet depicted on the March 1960 Albuquerque Sectional Chart. Matt Franklin reported, “To give some context of the area, there is but a few pueblos & houses nestled among the hills. 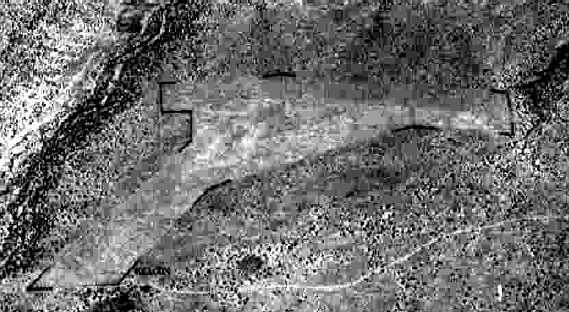 The earliest depiction which has been located of Torreon Airport was on the 1961 USGS topo map. It depicted a single north/south unpaved runway, labeled simply as “Landing Strip”. 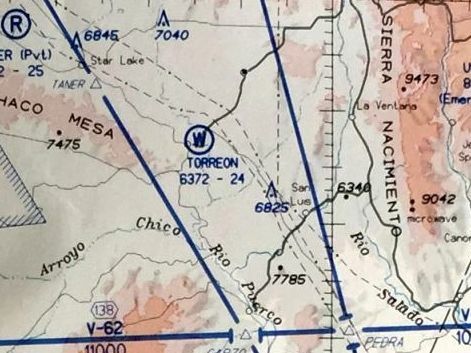 The earliest aeronautical chart depiction which has been located of Torreon Airport was on the May 1967 Sectional Chart (courtesy of Matt Franklin). 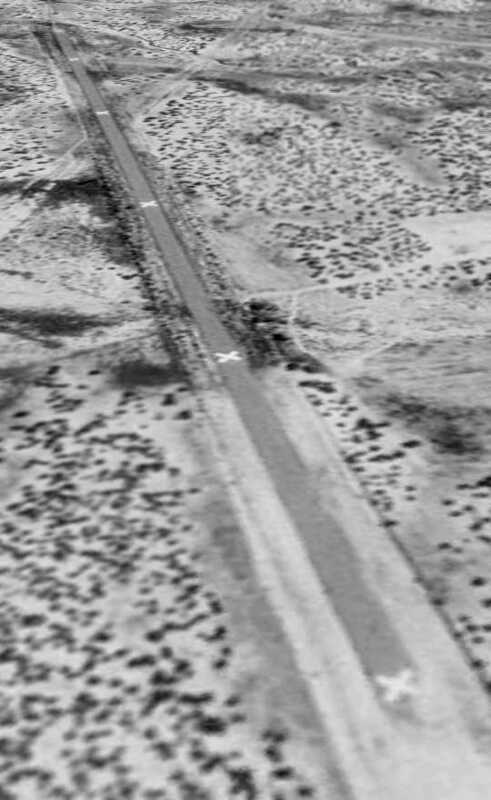 It depicted Torreon Airport as having a 2,400' unpaved runway. 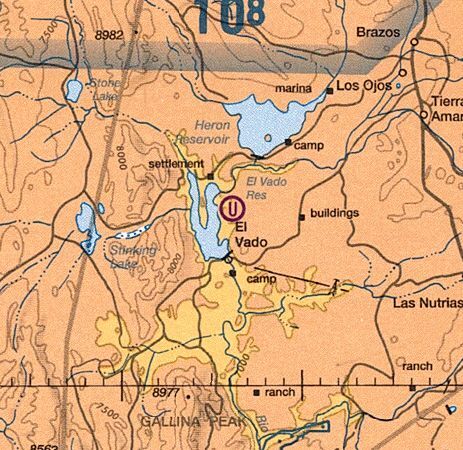 The 1989 USGS topo map depicted “Torreon Airport” as having as having a unpaved north/south runway. There were no buildings or other improvements depicted at the airport. The last aeronautical chart depiction which has been located of Torreon Airport was on the 1990-91 NM Aeronautical Chart (courtesy of Alex Hauzer). It depicted Torreon as a “Warning, uncertain or unverified” airfield, with a 2,400' unpaved runway. 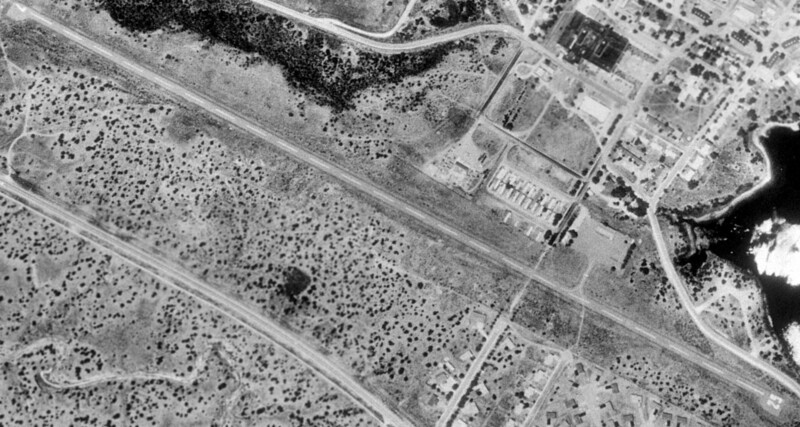 The earliest photo which has been located of Torreon Airport was a 1997 USGS aerial view looking northwest. Matt Franklin noted, “I would venture to guess that Torreon had been unused for some years, but the 1997 image shows the reason it will stay closed. 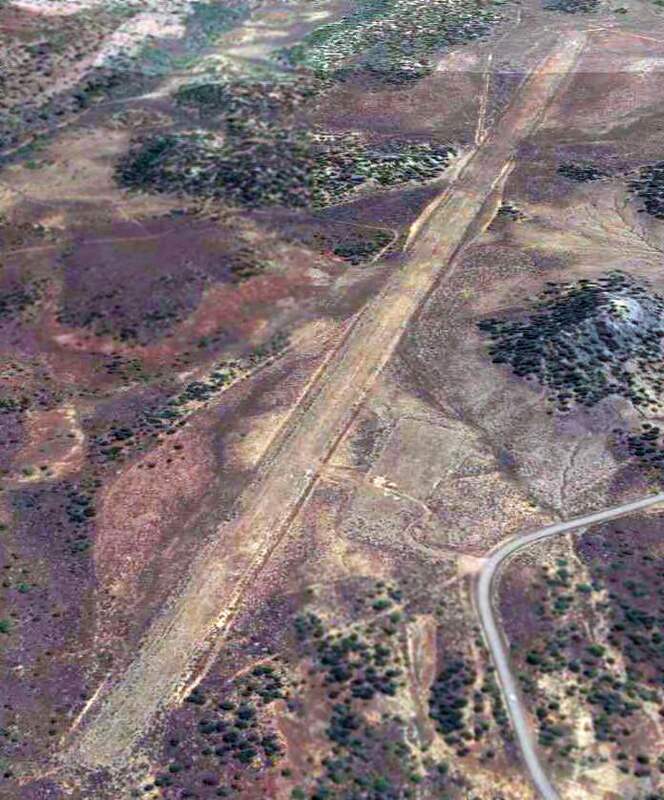 A 2014 aerial view looking northwest shows the Torreon Airport runway remained unchanged compared to the 1997 photo. A 2014 photo by Matt Franklin looking along the remains of the Torreon Airport runway. so I approached the airport from the south where I climbed a gate & followed the service road. It had been a long time since a vehicle had accessed the airport, but there were recent signs of horse tracks. There is a 100' hill at the south end of the runway. I don’t think a straight in approach would have been an option, and a turn to final would’ve been required while over the runway. There is significant buildup of scrub brush on the runway, but it’s certainly carved out of the terrain. The dirt on the surface is redder and relatively compacted. 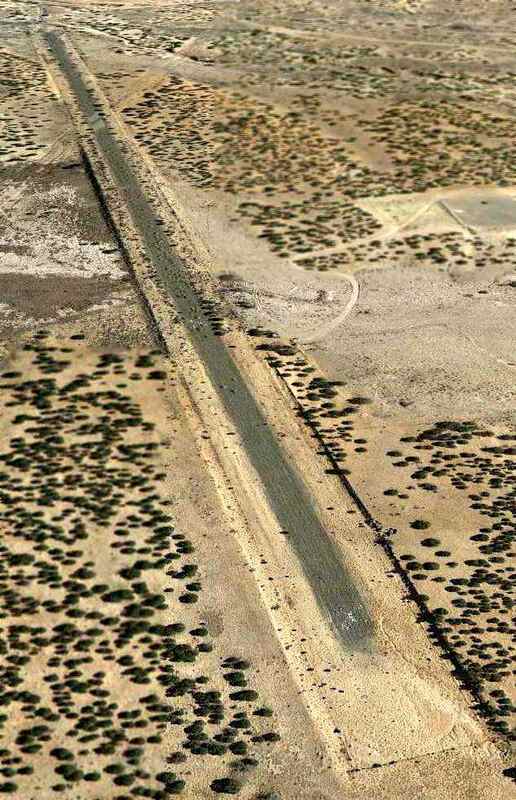 A 2014 photo by Matt Franklin of the gauge which cuts out of the northern end of the former Torreon Airport runway. 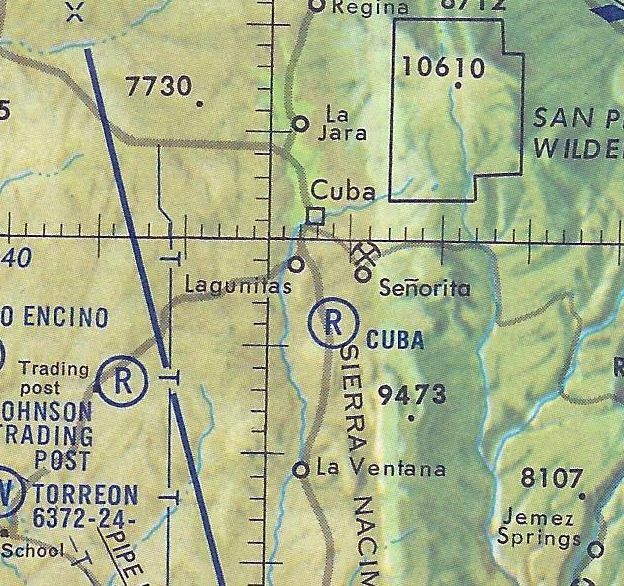 The site of Torreon Airport is located on the west side of Route 197, 26 miles southwest of Cuba, NM. 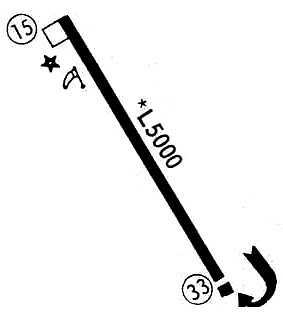 Cuba Airfield, as depicted on the 1985 NM Aeronautical Chart (courtesy of Andy Wells). 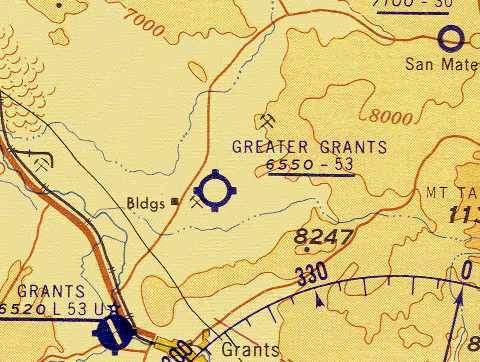 No airfield was depicted at this location on the Albuquerque Sectional Chart from 1932-68. 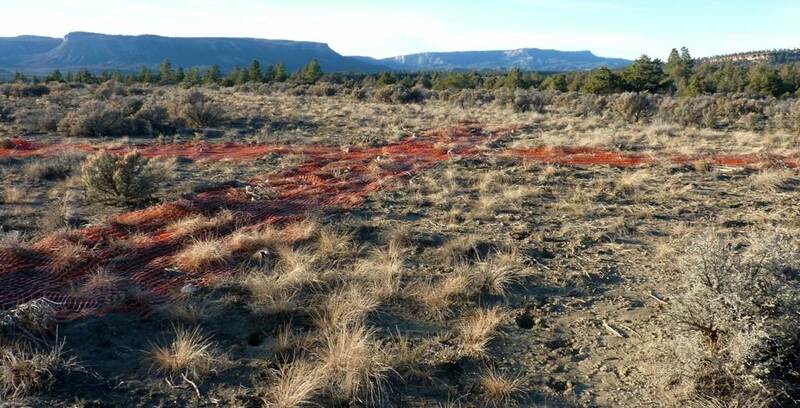 Andy Wells recalled, “There was an unpaved airstrip just south of Cuba NM, which had apparently been built in connection with a mining operation. Back in the 1980s it was considered open to the public, or at least we treated it that way. I landed there in a Cessna 206 to deliver some passengers on a charter flight. It was good enough that I got the impression that it might be receiving an occasional grading. It had no identifier then, that I knew of, but appeared on the World Aeronautical Chart scale aviation chart that New Mexico published periodically. 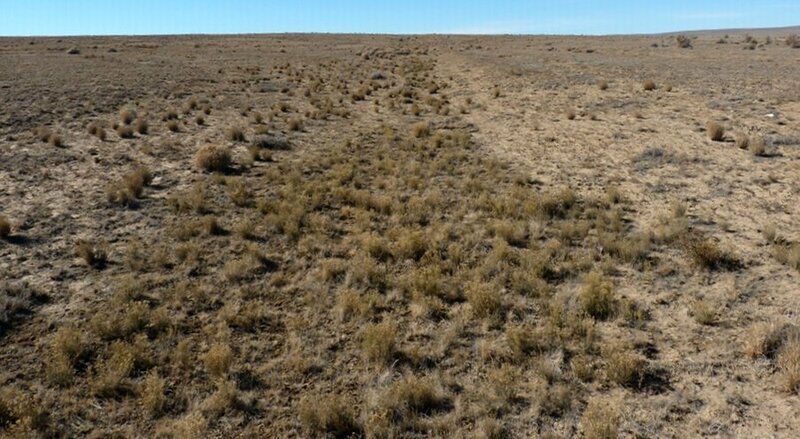 Even at its best, it was a pretty basic strip: no paving, no buildings, no aircraft parking area, no nothin', unless you count coyotes, jack rabbits, and sagebrush. 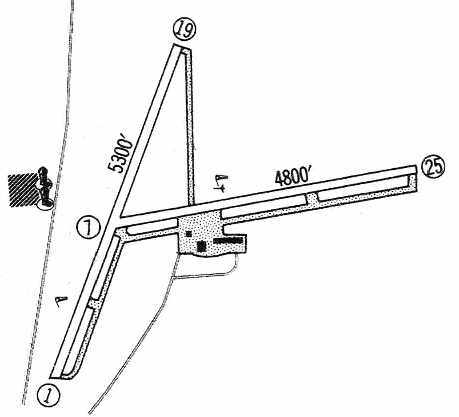 The earliest depiction which has been located of Cuba Airfield was on the 1985 NM Aeronautical Chart (courtesy of Andy Wells). 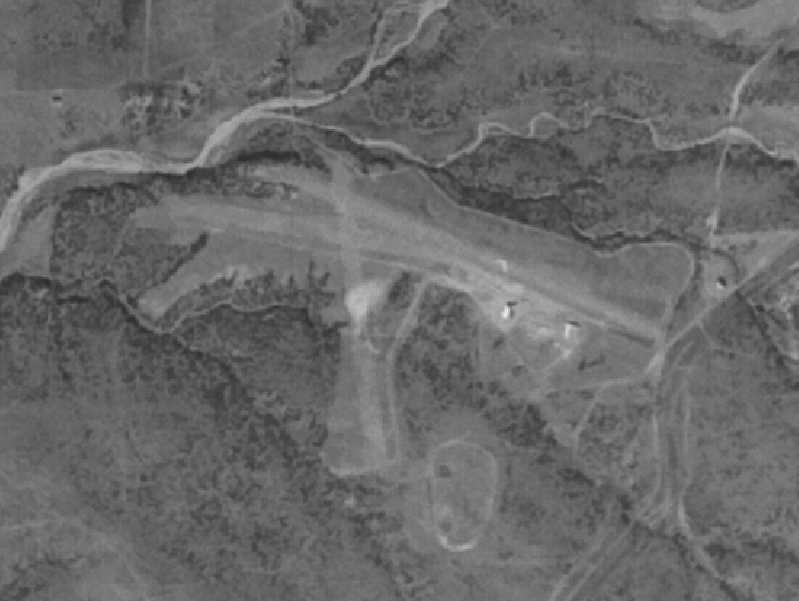 The earliest photo which has been located of the Cuba Airfield was on a 1995 USGS aerial view looking west. It depicted Cuba as having a single northeast/southwest unpaved runway. 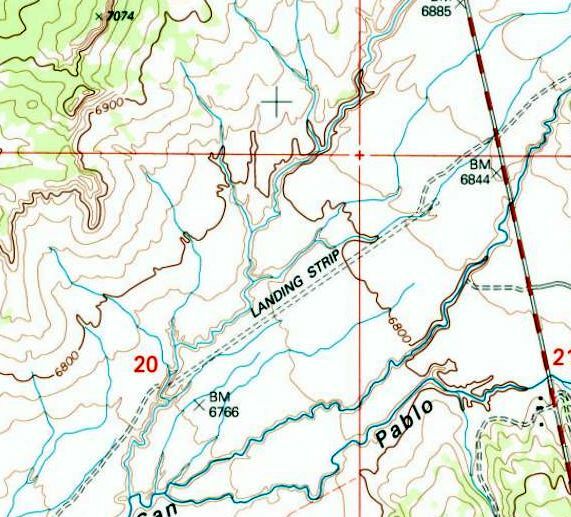 The 2002 USGS topo map depicted Cuba Airfield as a northeast/southwest unpaved runway, labeled simply as “Landing Strip”. A 2014 aerial view looking west depicted Cuba Airfield as remaining intact. A November 2015 photo by Andy Wells of his Cessna 170 at Cuba Airfield. Andy reported, “The strip is no longer on the current charts, neither state nor federal. Cuba Airfield is located west of the intersection of Route 11 & San Pablo Road. Thanks to Andy Wells for pointing out this airfield. 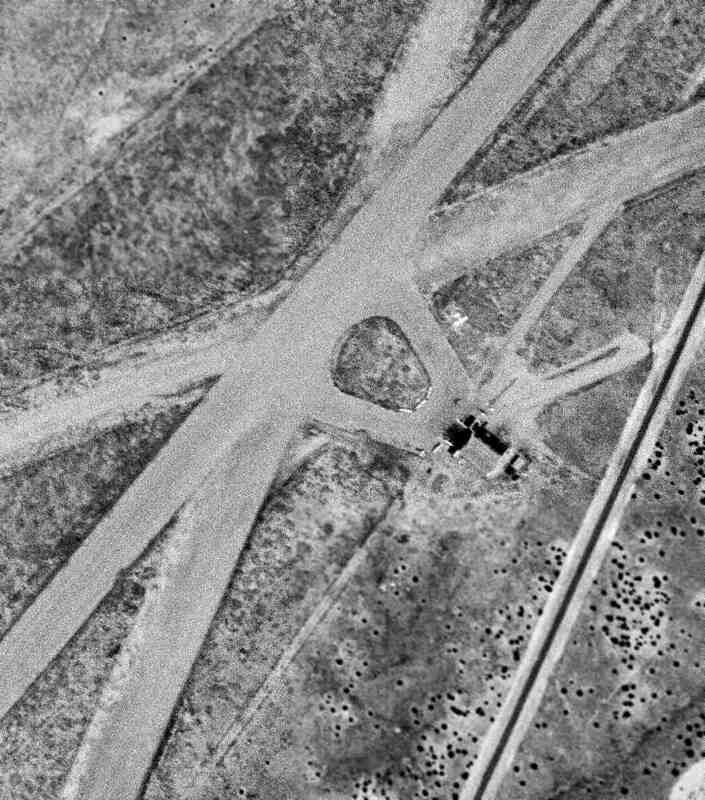 A 9/22/65 USGS aerial view of the Chaco Canyon Airfield. Andy Bushnell recalled, “My Aunt & Uncle had a trading post near Chaco Canyon from the early 1950s into the 1960s. I remember riding with my Uncle taking off on that runway in a V-tail Beechcraft. 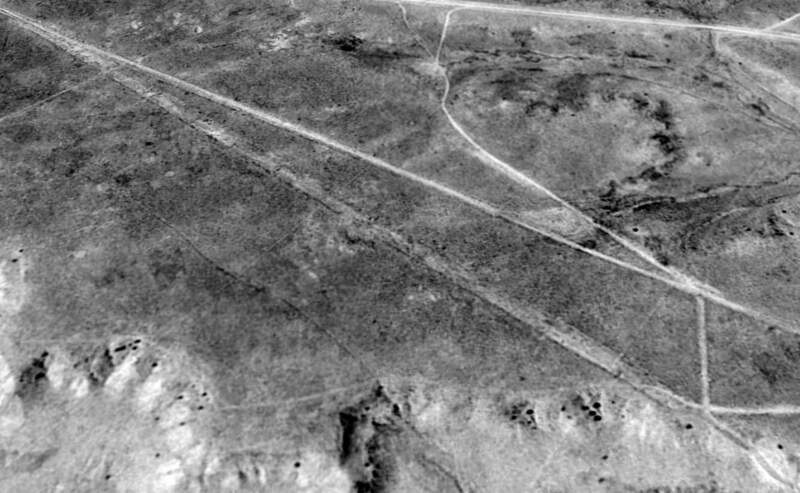 The earliest depiction which has been located of Chaco Canyon Airfield was on a 9/22/65 USGS aerial view. It depicted 2 unpaved runways, with the trading post on the east side. 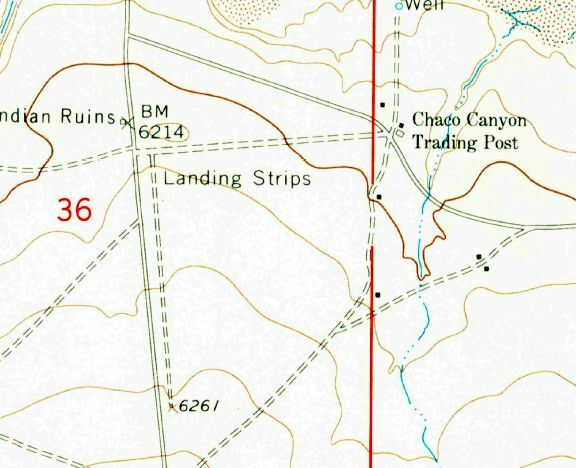 The 1966 USGS topo map depicted 2 unpaved “Landing Strips” to the west of the Chaco Canyon Trading Post. 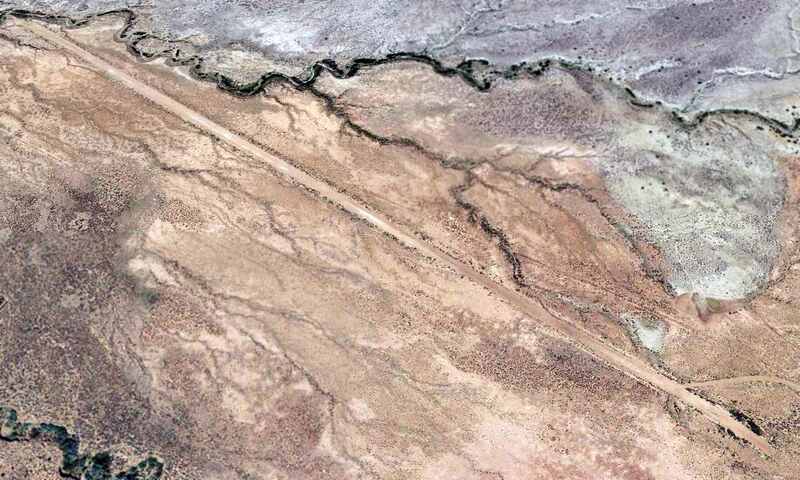 A 6/24/14 aerial view looking northwest shows the remains of the Chacho Canyon Airfield. In the bottom-center is visible the ruins of the trading post, along with a later building (possibly a school). An 11/27/14 photo by Matt Franklin at the Chaco Canyon Airfield, “facing west along the runway from the edge of the road. “of the building now occupying the end of the runway adjacent to the foundation of the trading post, which is the Chaco Navajo Church. 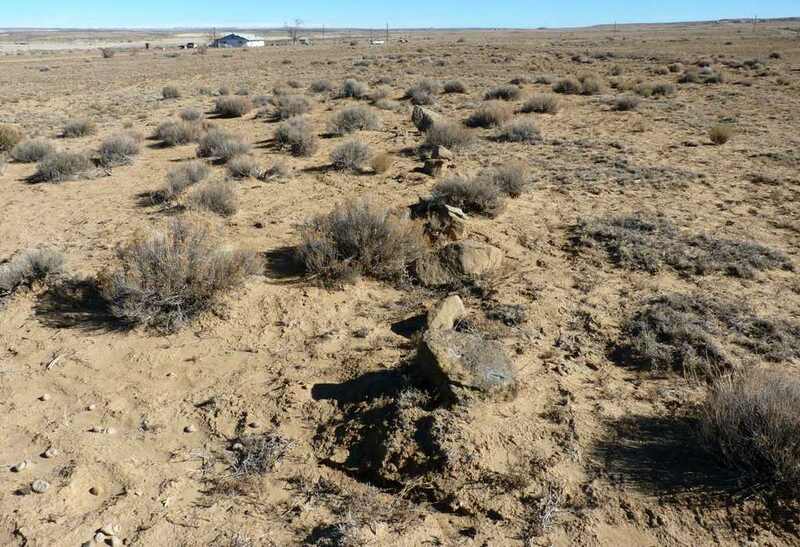 The site of Chaco Canyon Airfield is located east of the intersection of Route 57 & Route 7980. Thanks to Andy Bushnell for pointing out this airfield. 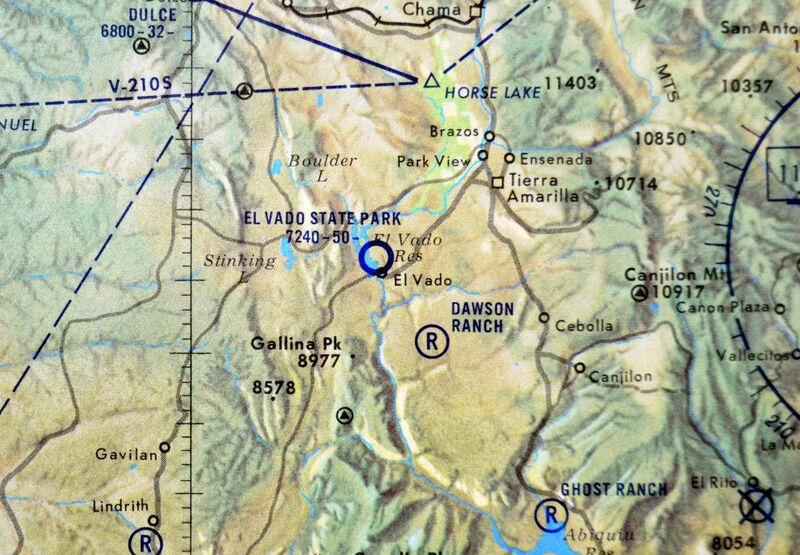 El Vado State Park Airport, as depicted on the 1968 NM Aeronautical Chart (courtesy of Fred DeGuio). as it was not yet depicted on the 1964 USGS topo map. The earliest depiction which has been located of El Vado State Park Airport was on the 1968 NM Aeronautical Chart (courtesy of Fred DeGuio). It depicted El Vado State Park Airport as having a 5,000' runway. 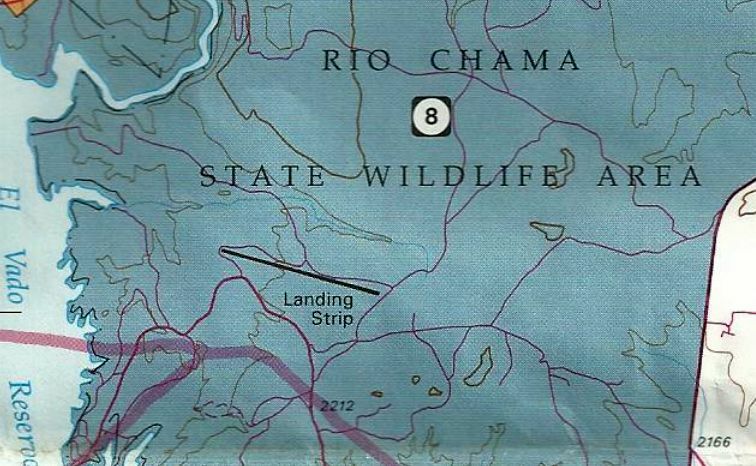 The 1982 USGS topo map depicted a single northwest/southeast runway, labeled simply as “Landing Strip”. 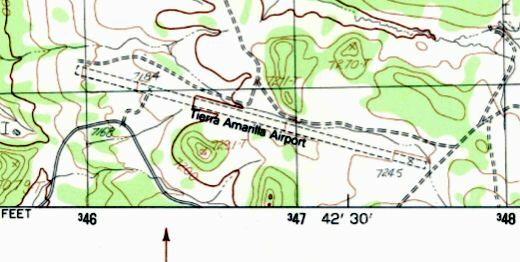 The 1983 USGS topo map depicted “Tierra Amarilla Airport” as having a single unpaved northwest/southeast runway. No buildings were depicted at the airport. 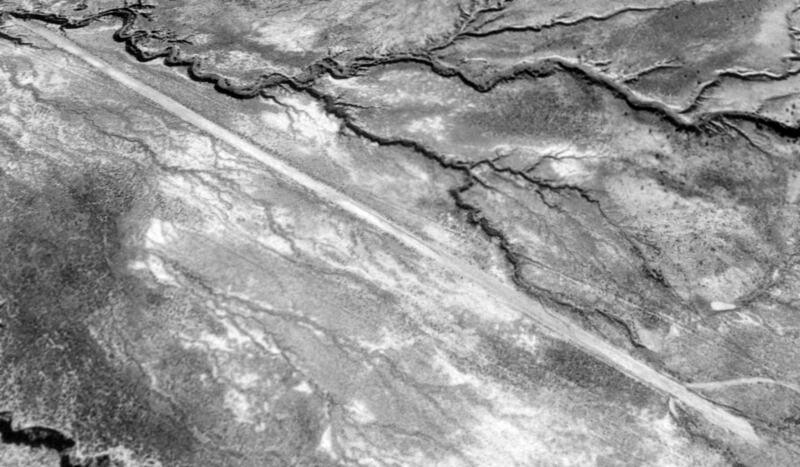 The earliest photo which has been located of Tierra Amarilla Airport was a 10/3/97 USGS aerial view looking east. It depicted Tierra Amarilla as having a single unpaved northwest/southeast runway, with a ramp on the south side. 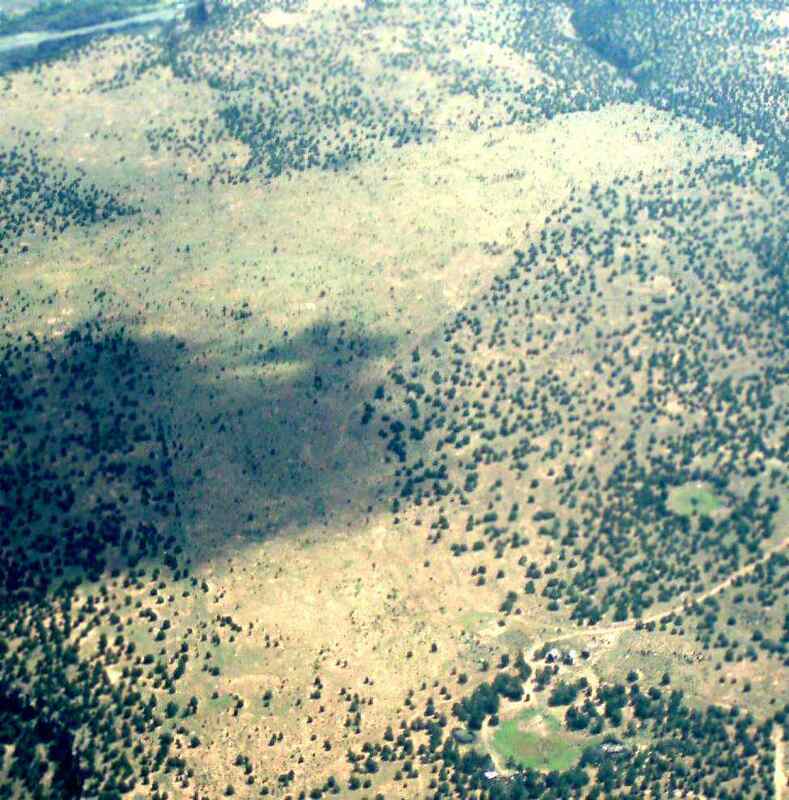 A 10/22/11 aerial view looking east showed Tierra Amarilla to remain intact though deteriorated. 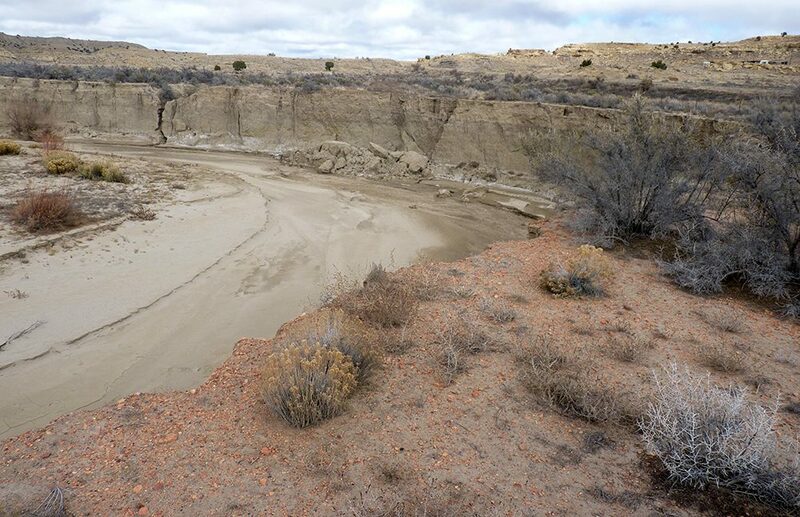 within the Rio Chama State Wildlife Area. The 2013 Sectional Chart depicted Tierra Amarilla Airport as an “Unverified” airfield. An August 2013 photo by Eric Hinz “taken facing roughly southeast just past the approach end (northwest) of the runway). The strip is a prepared (graded) runway, unsurfaced. While a lot of plants have grown up on the field, the actual surface on the northwest end appears to be in fairly good shape. A small bush plane might be able to land (the prop would take out some weeds). An August 2013 photo by Eric Hinz of “the segmented circle, built of drums cut in half, painted & mounted on posts. 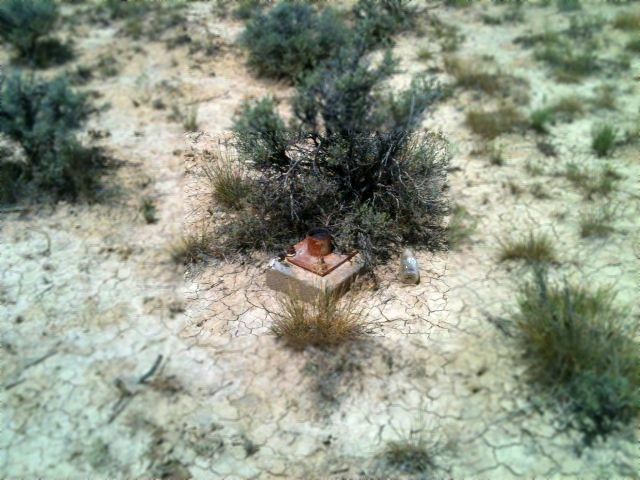 An August 2013 photo by Eric Hinz of “the wind direction indicator (wind sock) base. As of 2013, road maps label the airfield as El Vado State Park Airport. An 11/27/14 photo by Matt Franklin of El Vado State Park Airport, of “a line of posts that define the edge of the ramp area. The ramp area, as well as the runway, was easily picked out from the surrounding terrain. The runway was filled in & graded, and the weeds were much lower in the airport space. There had been significant precipitation in the days before that made the ground very soft & easy to sink in to. I walked ¾ of the length of the field before a deer ran out & I didn’t want to bother it. An 11/27/14 photo by Matt Franklin of El Vado State Park Airport, which “shows this airport isn’t totally forgotten. 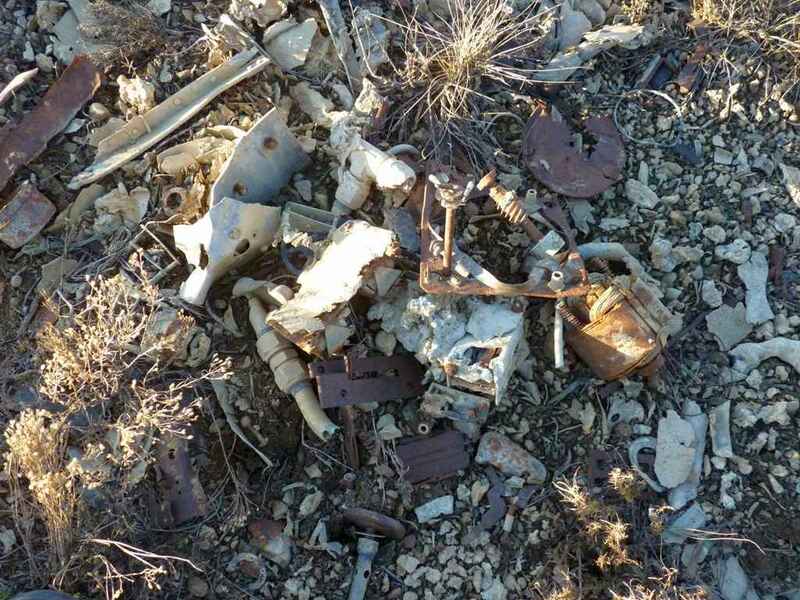 An 11/27/14 photo by Matt Franklin of a collection of aircraft parts which remain at El Vado State Park Airport from a 1/10/76 Beech TC-45G accident. Matt summarized, “In 1976 some drug runners hit the barrels defining the runway edges in their Beech 18 & lit the airplane on fire. These are the parts from that plane. While it would’ve been cool to find the charred Beechcraft fuselage, these parts will have to suffice. 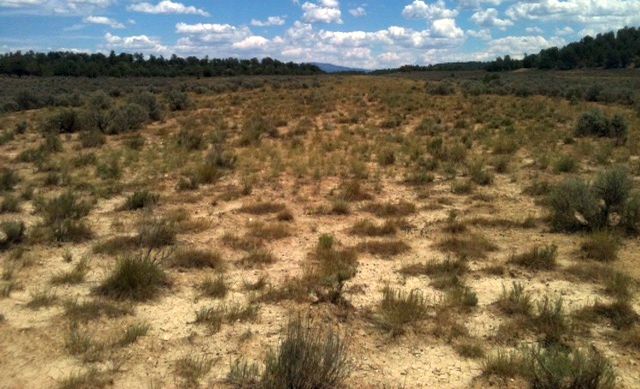 The site of El Vado State Park Airport is located 3 miles north of NM State Road 112, east of El Vado Lake. Thanks to Eric Hinz for pointing out this airfield. The original Santa Fe Airport, as depicted on the March 1932 Albuquerque Sectional Chart. halfway between Santa Fe & Aqua Fria. The date of establishment of Santa Fe Airport has not been determined. 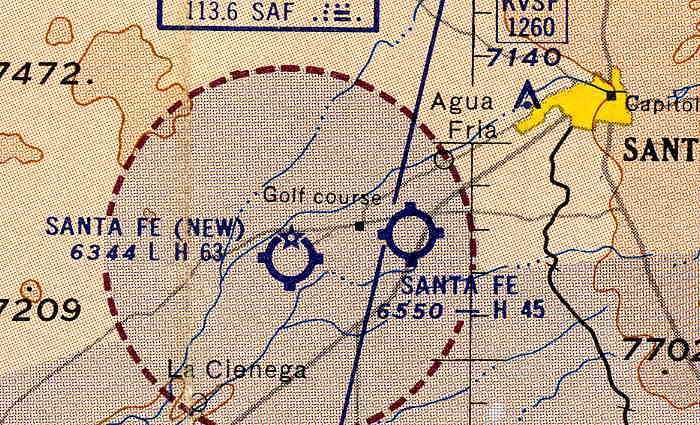 The earliest depiction which has been located of Santa Fe Airport was on the March 1932 Albuquerque Sectional Chart. as depicted on the 1935 Albuquerque Sectional Chart. with a few small buildings on the southeast & northwest sides. with a few small buildings on the southeast & northwest side, but labeled the field generically as “Airport”. 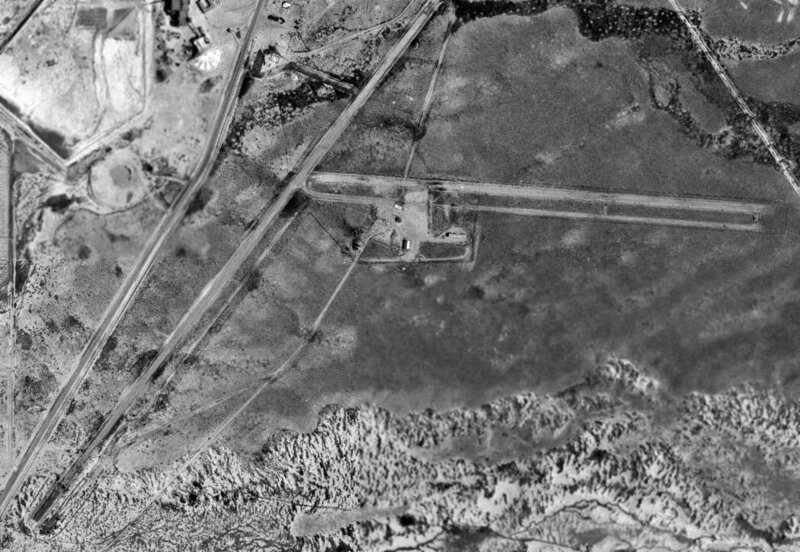 The last photo which has been located of the Ashley Pond Airport was an 8/18/60 USGS aerial photo. The 1962 USGS topo map no longer depicted the runways at all, although the airport buildings remained depicted. 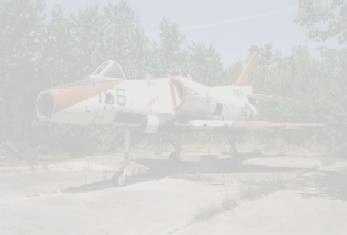 and not a trace appeared to remain of Ashley Pond Airport. A 6/16/11 aerial photo did not show any recognizable trace of Ashley Pond Airport. The site of Ashley Pond Airport is located northwest of the intersection of Interstate 25 & South St. Francis Drive. Thanks to Bruce Mergele for pointing out this airfield. 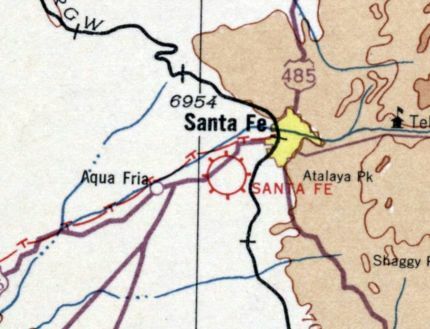 The 2nd location of the Santa Fe Municipal Airport, as depicted on the 1935 Albuquerque Sectional Chart. 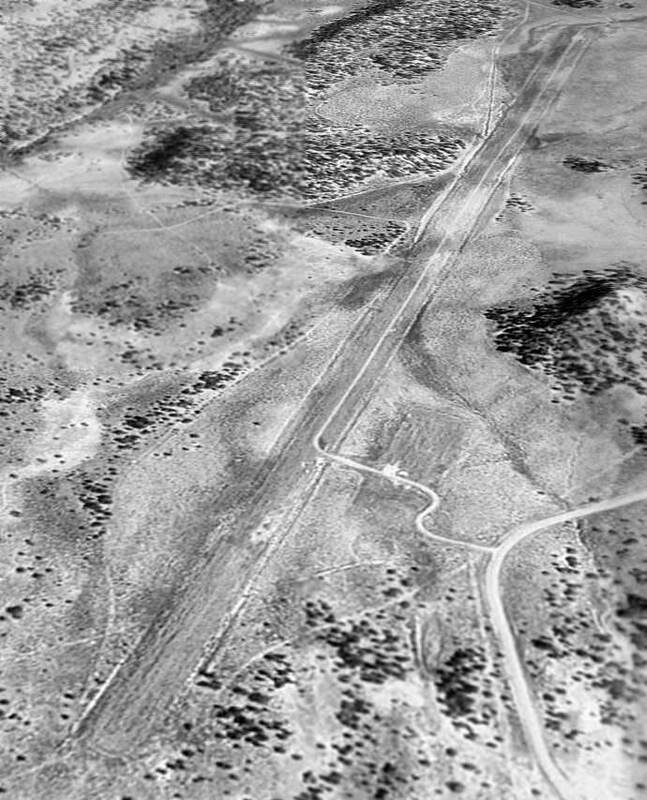 At some point between 1932-35, the original Santa Fe Airport was replaced by a new Santa Fe Airport 6 NM southwest of Santa Fe, adjacent to the south side of the town of Aqua Fria. The earliest depiction which has been located of the 2nd location of Santa Fe Municipal Airport was on the 1935 Albuquerque Sectional Chart. was a 10/7/43 aerial view looking north from the 1945 AAF Airfield Directory (courtesy of Scott Murdock). 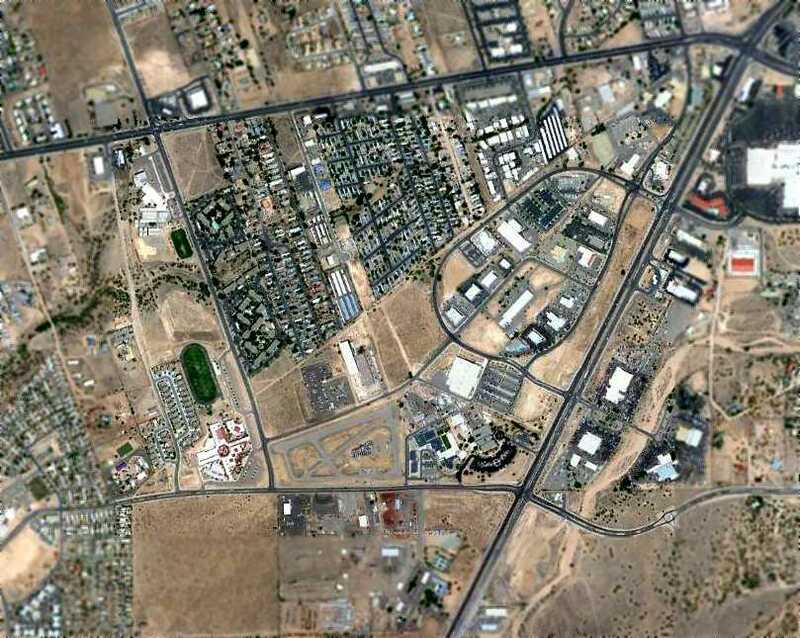 It depicted “Santa Fe Municipal Airport (Old)” as having 4 runways, with a single building on the east side. Another 10/7/43 photo in the same directory showed that a new Santa Fe Municipal Airport had been constructed 4 miles further southwest. and 3 shorter “turf” runways (which probably didn't have much turf!). to be owned by the City of Santa Fe, and to be operated by private interests. 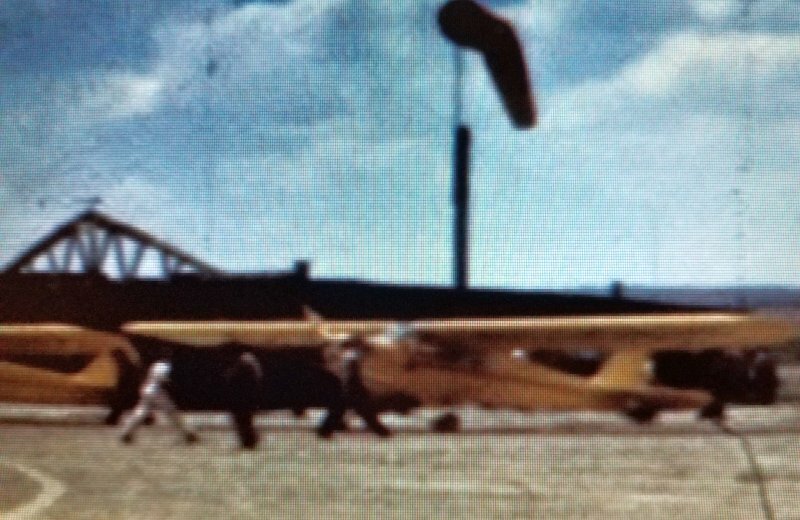 Robert Owens recalled, “I remembered flying into the old Santa Fe Airport. 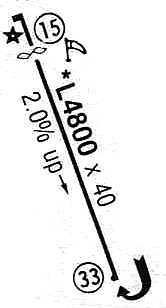 My pilot's logbook has a note that the elevation of the old airport was 6,500' MSL. I was very concerned about getting that Culver V off the short runway (3,400'?) in July. I barely made it at sunrise! with taxiways leading to a single small building on the east side. 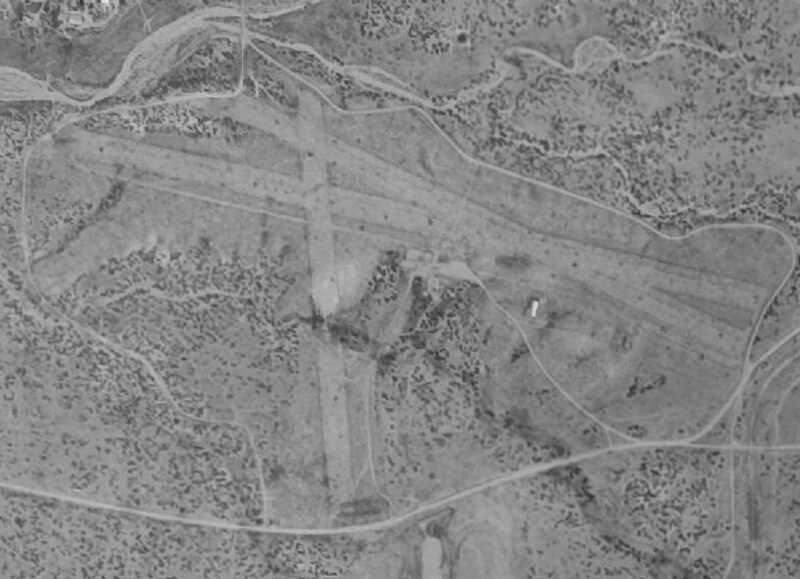 The last photo which has been located of the 2nd location of Santa Fe Municipal Airport was a 6/1/51 USGS aerial view. 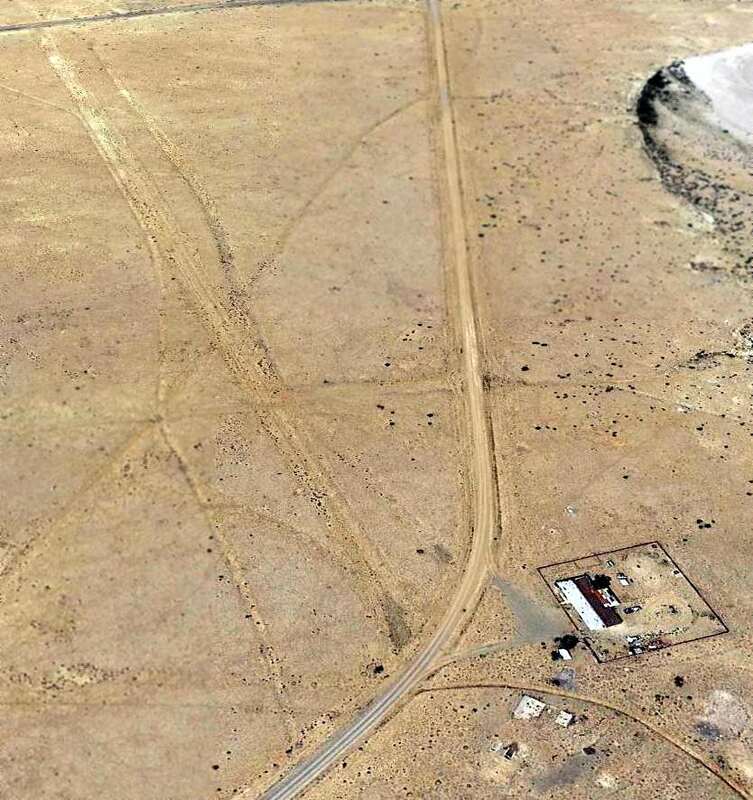 It depicted Santa Fe Municipal Airport as having 4 unpaved runways. 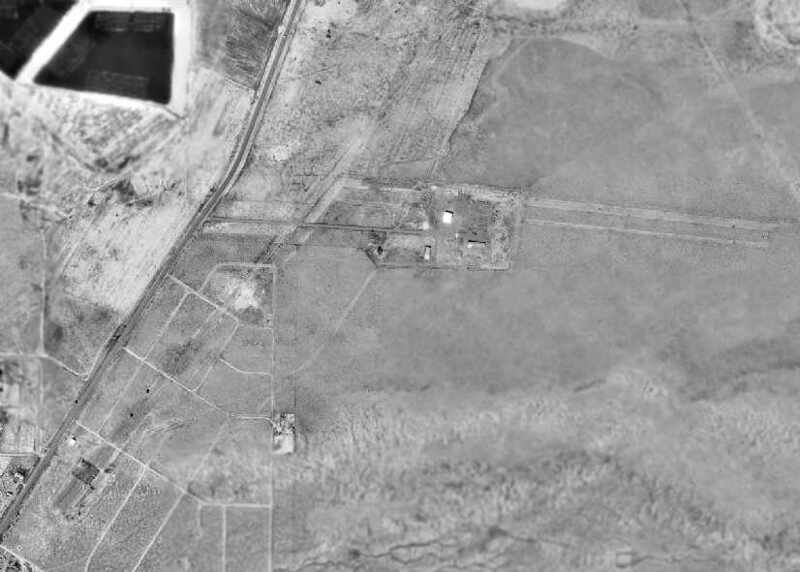 A closeup of the 6/1/51 USGS aerial view depicted 5 single-engine light planes & a single building on the east side of the 2nd location of Santa Fe Municipal Airport. along with the “Santa Fe (New)” airport to the southwest. 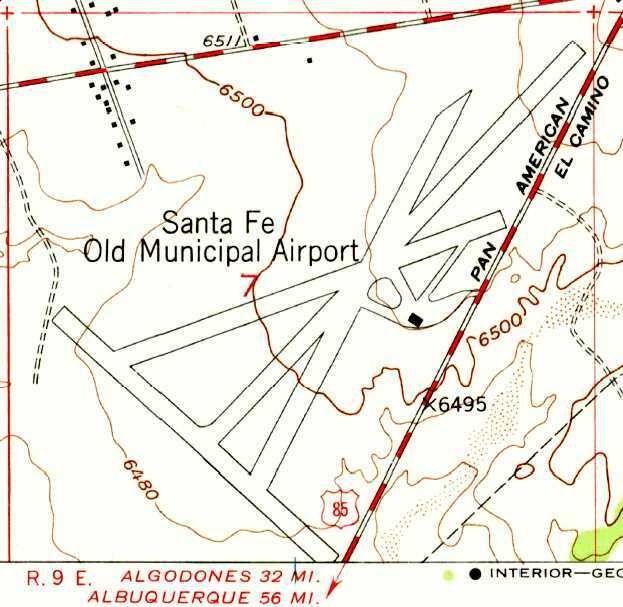 The 1973 USGS topo map continued to depict the “Santa Fe Old Municipal Airport” in an unchanged fashion. as it was no longer depicted at all on the 1979 USGS topo map. Instead several new streets & a variety of buildings were depicted over the airport site. 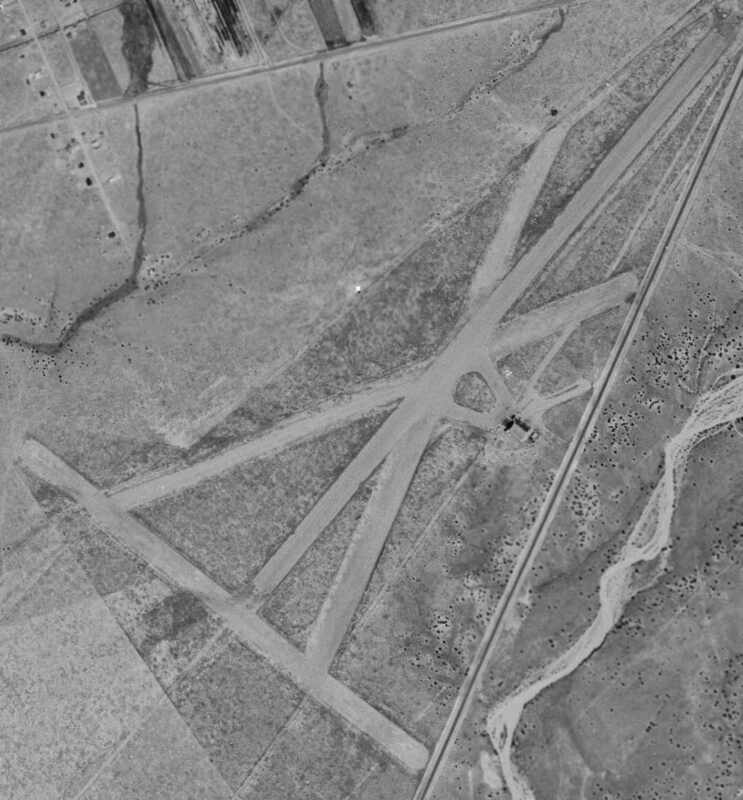 No trace was recognizable of the 2nd location of Santa Fe Municipal Airport in a 1996 USGS aerial photo. I received a confirmation that there used to be an airport right at the intersection of Airport Road & Cerrillos Road. 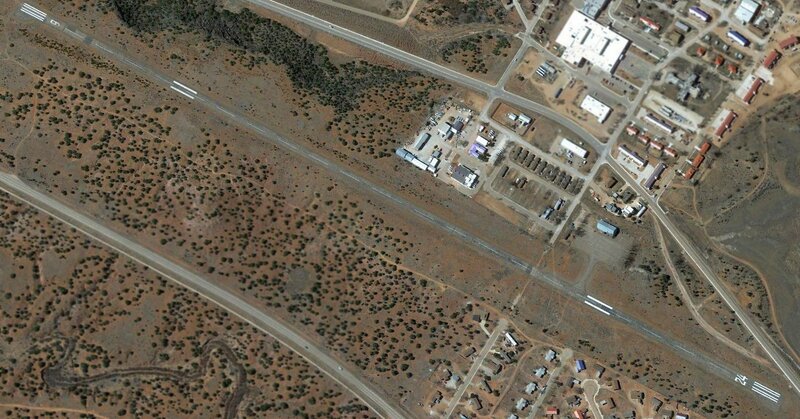 A 6/27/11 aerial photo did not show any recognizable trace of the 2nd location of Santa Fe Municipal Airport. Acomita Intermediate Field, as depicted on the April 1935 Albuquerque Sectional Chart (courtesy of Dan Deloria). for the emergency use of commercial aircraft flying along airways between major cities. as it was not yet listed among active airfields in the 1929 Union Oil Airport Directory (according to Chris Kennedy). described Acomita as the Department of Commerce's Site 63 on the Los Angeles – Amarillo airway. with 3 runways (4,130' north/south & northeast/southwest, and 3,360' east/west). was on the April 1935 Albuquerque Sectional Chart (courtesy of Dan Deloria). It depicted the Acomita Landind Field as being Site 63. 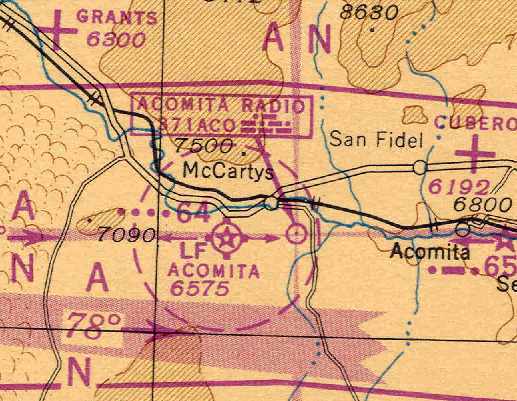 The April 1941 Albuquerque Sectional Chart (courtesy of Chris Kennedy) depicted the field as Site 63.
depicted Acomita Intermediate Field as having 3 unpaved runways. the longest being the 4,130' NNE/SSW strip. Acomita was described as being owned by private interests, and operated by the Civil Aeronautics Administration. described Acomita as the Civil Aeronautics Adminstration's Site #63. The field was characterized as “Class 2”, privately owned, but operated by the CAA. with the longest being the 4,130' north/south strip. 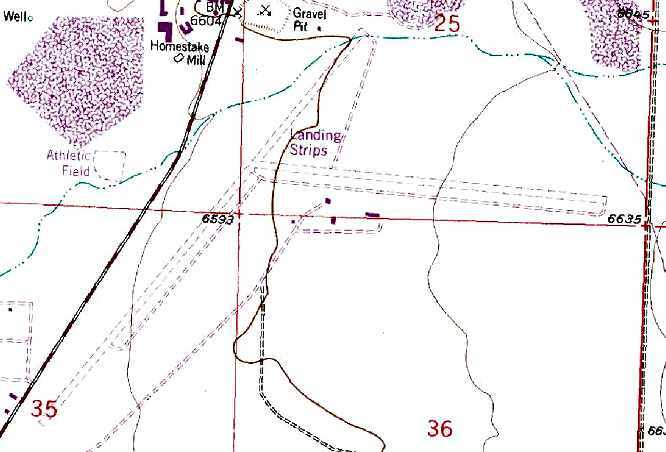 Its designation had evidently changed at some point between 1945-48 to Site 64.
was in the November 1949 USAF Pilot's Handbook (courtesy of Chris Kennedy). It depicted the field a having 3 unpaved runways, with the longest being the 4,130' northeast/southwest strip. No buildings were depicted at the field. An undated (circa late 1940s – early 1950s?) photo of several buildings & the beacon tower at Acomita (courtesy of Trey Brandt). An undated (circa late 1940s – early 1950s?) 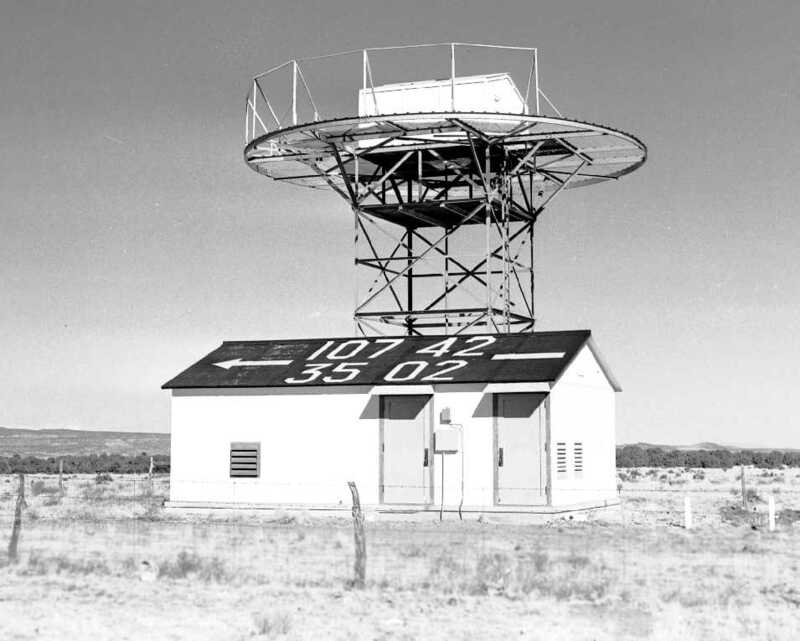 photo of a navigational aid at Acomita (courtesy of Trey Brandt). A November 1952 photo of the “Airport Day” ay the Acomita Airport (courtesy of Matt Franklin)., removing cables from Acomita to be reinstalled at Grants Airport. “In November 1952, the Grants Chamber of Commerce held 'Airport Day' at the Acomita Airport. as it was no longer depicted at all on the September 1954 Albuquerque Sectional Chart (according to Chris Kennedy). had obviated the need for the system of Intermediate Fields by that point. 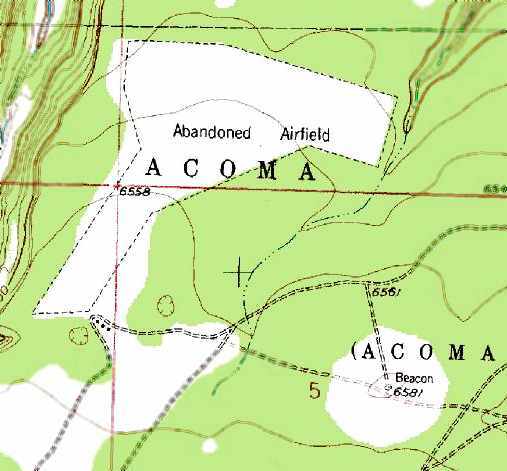 Acomita was labeled as an “Abandoned Airfield” on the 1959 USGS topo map. 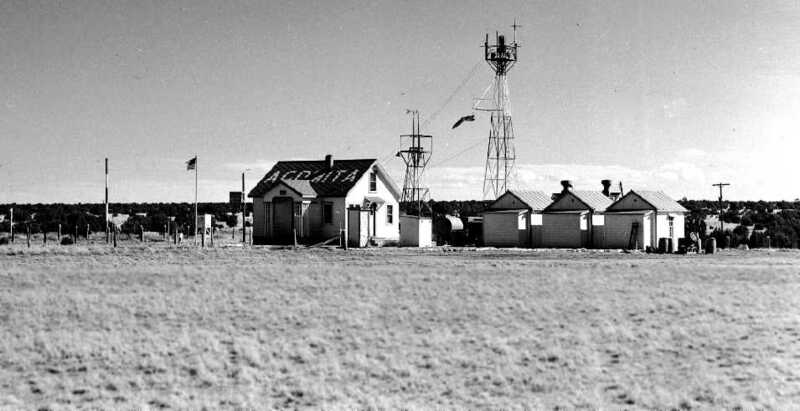 Its former airway beacon was also still depicted, to the southeast of the airfield. 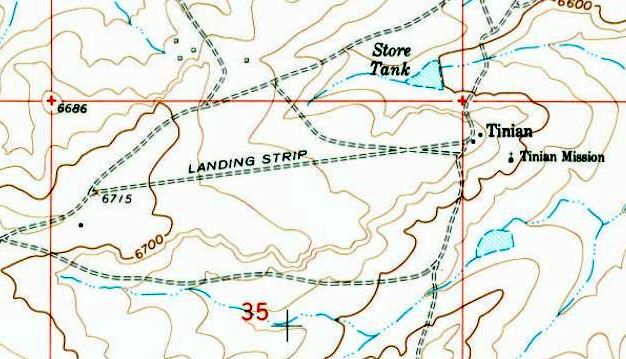 it was still depicted as an “Abandoned Airfield” on the 1991 USGS topo map. 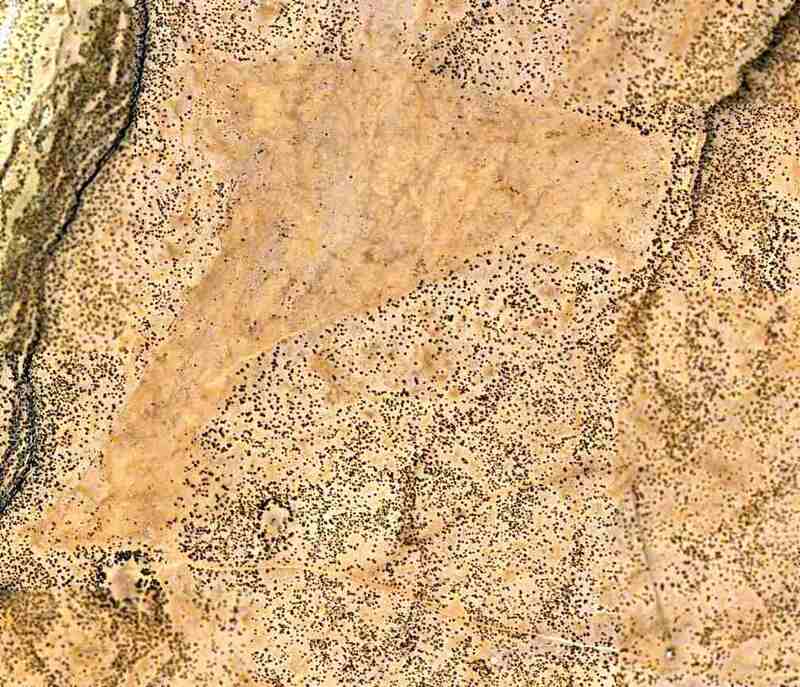 The outline of the former Acomita Intermediate Field was still quite recognizable on a 7/25/11 aerial photo. Note that the former airway beacon also still appeared to remain, just southeast of the airfield. 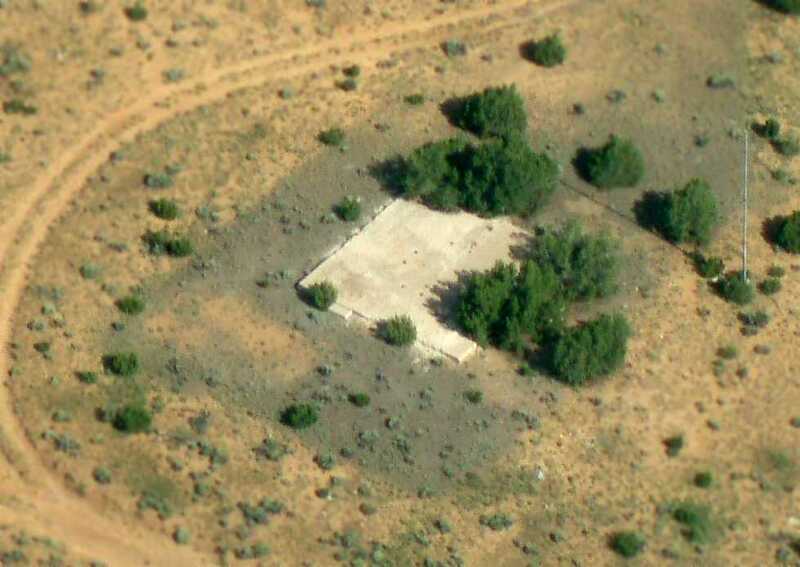 A 2012 aerial photo by Greg Farmer of what appears to be a foundation & a pole (flagpole, windsock pole?) at the site of Acomita Intermediate Field. A 2012 aerial view by Greg Farmer looking northeast at the remains of the Acomita runways. 8 miles west of Acomita, NM. 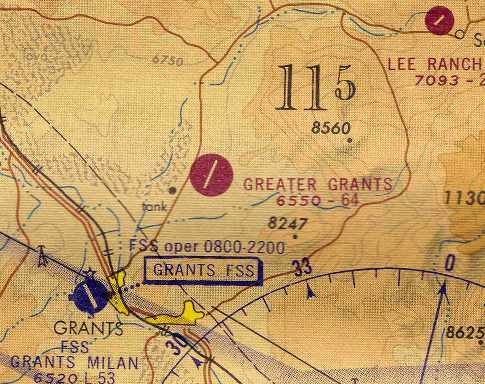 The Greater Grants Airport, as depicted on the September 1960 Albuquerque Sectional Chart (courtesy of Chris Kennedy). This fairly large airport was located 5 miles north of Grants. as it was not yet depicted on the May 1958 Albuquerque Sectional Chart (according to Chris Kennedy) nor on the 1959 USGS topo map. when the local Civil Air Patrol was offered land there for a radio building & office/hangar space. was on the September 1960 Albuquerque Sectional Chart (courtesy of Chris Kennedy). It depicted the field as having a 5,300' unpaved runway. at the time the airport was open, due to uranium mining. A ramp southeast of the runway intersection had 3 buildings. described the Greater Grants Airport as having 2 dirt runways: 6,500' Runway 18/36 & 5,000' Runway 9/27. and was operated by Uranium Frontier Airways. Jim Axelson recalled, “Greater Grants Airport... my father Leon Axelson managed & operated the airport” until 1964. It would appear that the airfield & its businesses lost energy from that point on. depicted the field as having a single 6,500' paved Runway 1/19. A ramp on the east side had 3 buildings. It depicted Greater Grants as having a single 6,400' paved runway. 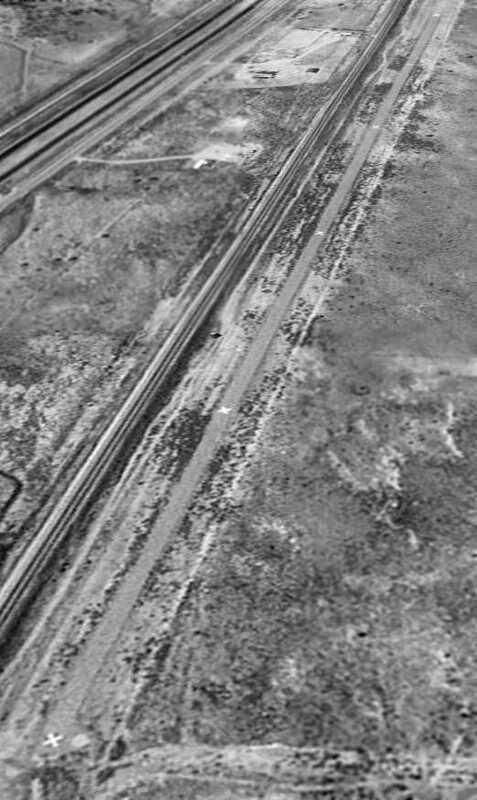 A 8/15/71 USGS aerial photo depicted the Greater Grants Airport as having 2 unpaved runways & a dirt ramp southeast of the runway intersection with 3 small buildings. There were no aircraft visible on the field, and it was indeterminate whether the airport was still open at that point. as it was no longer listed among active airfields in the 1976 AOPA Airports USA Directory (according to Chris Kennedy). as well as four buildings at the site of the Greater Grants Airport, which was labeled simply as “Landing Strips”. 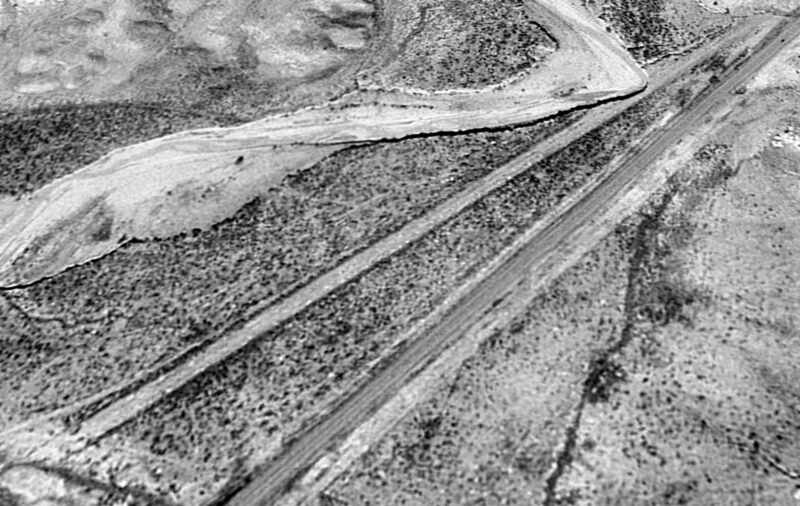 A 1997 USGS aerial photo of the Greater Grants Airport site showed that much of the former east/west runway & its parallel taxiway still remained intact. Traces of the former northeast/southwest runway were still recognizable, but the southwest portion of it had been covered by a street grid. The former airport buildings also remained standing. A 5/4/12 aerial photo showed that much of the former east/west runway & its parallel taxiway still remained intact. Traces of the former northeast/southwest runway were still recognizable, and the former airport buildings also remained standing. 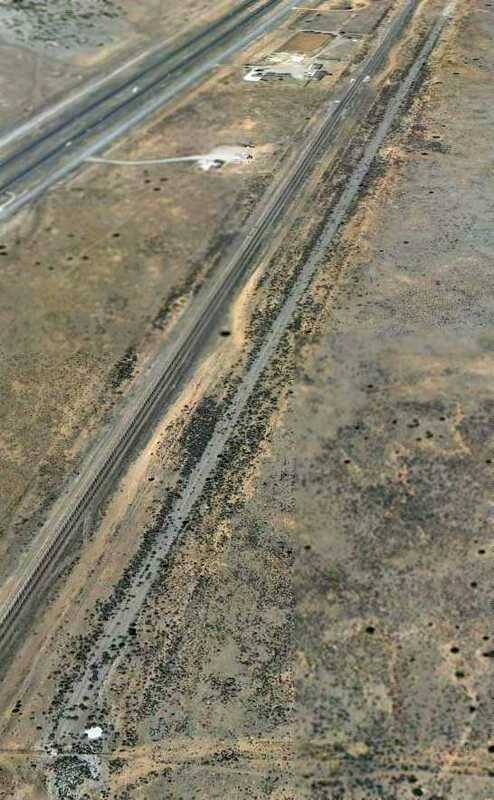 The site of Greater Grants Airport is located northeast of the intersection of Route 605 & Tumbleweed Road. as depicted on the August 1962 USAF Operational Navigation Chart (courtesy of Chris Kennedy). 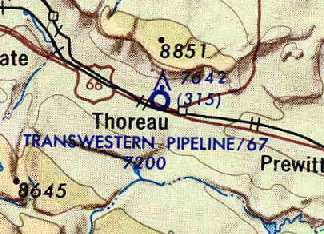 whose pipeline runs adjacent to the airfield to the north. 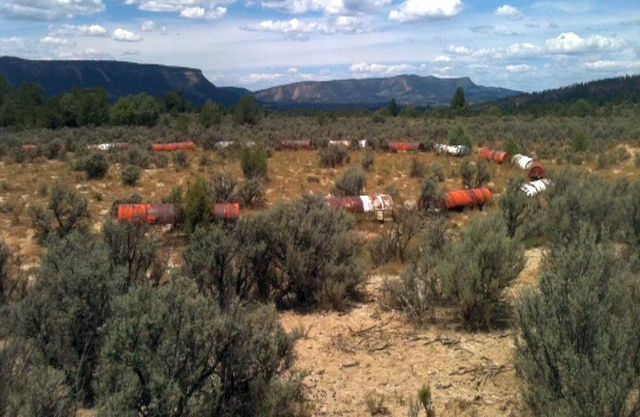 located along the pipeline (according to a map located by David Brooks). 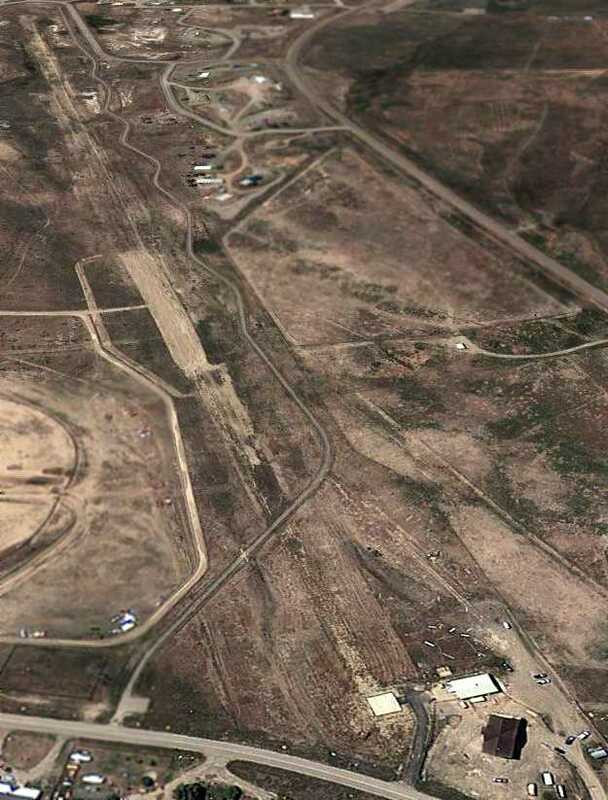 The date of construction of the Transwestern #5 Airfield has not been determined. was on the August 1962 USAF Operational Navigation Chart (courtesy of Chris Kennedy). It described the field as having a 6,700' runway. as having a single 5,000' paved runway. 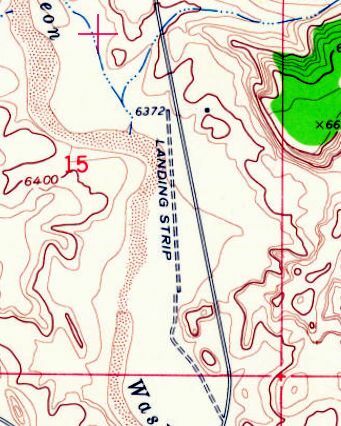 The 1980 USGS topo map still depicted the runway, labeled simply as "Landing Strip". Transwestern #5 was still listed as a private airfield in the 1982 AOPA Airport Directory (courtesy of Ed Drury). but apparently were closed at some point between 1995-97, when they were no longer depicted on aeronautical charts. 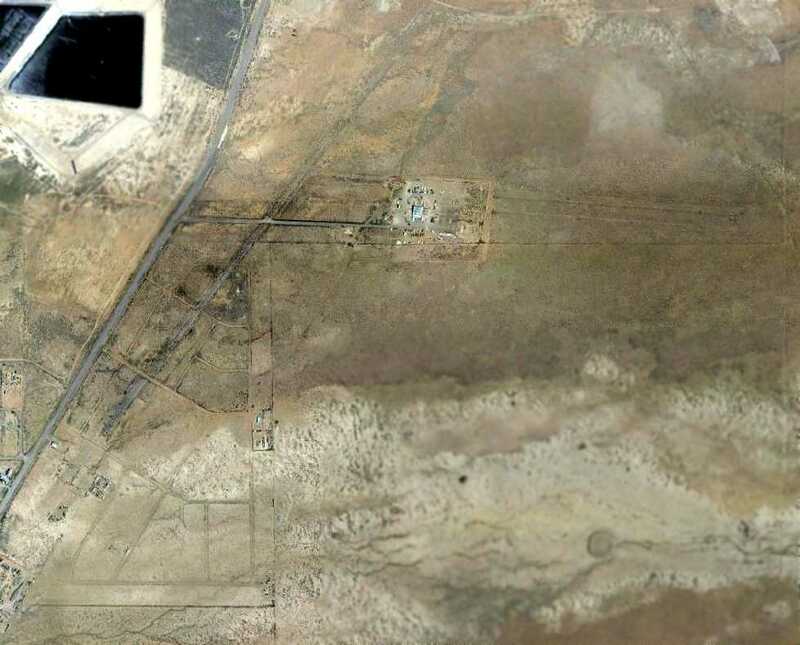 as a 10/15/97 USGS aerial view looking west depicted the runway as being painted with "X" closed runway markings. 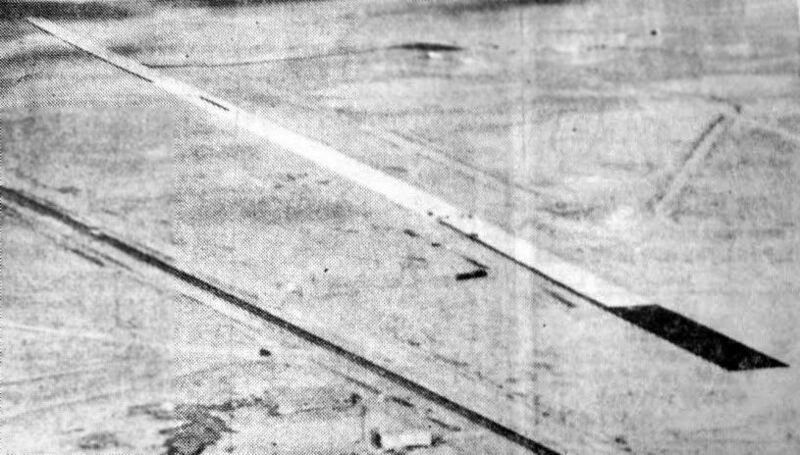 as the aerial photo depicted the runway as being 7,000' long. but were no longer recognizable in a 2009 aerial view. 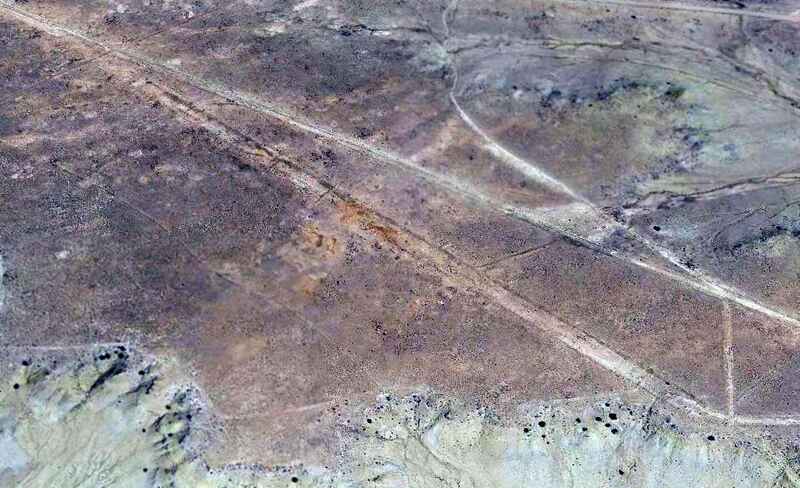 A 5/3/12 aerial view looking west at the remains of the Transwestern #5 airfield showed the runway to remain intact but very deteriorated. 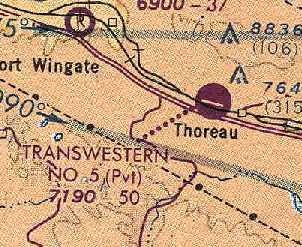 Transwestern #6, as depicted on the July 1977 World Aeronautical Chart (courtesy of Chris Kennedy). as it was not yet depicted on the 1959 USGS topo map. was on the July 1977 World Aeronautical Chart (courtesy of Chris Kennedy). It described the field as having a single 5,000' paved runway. It was listed as an active private airfield in the 1982 AOPA Airport Directory (courtesy of Ed Drury). as being painted with "X" closed runway markings. with the closed-runway “X” symbols remaining barely recognizable. 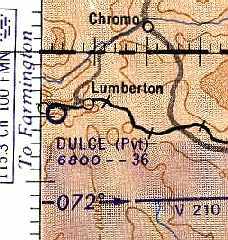 Dulce Airport, as depicted on the October 1963 Sangre De Christo Mountains World Aeronautical Chart (courtesy of Donald Felton). The date of construction of the Dulce Airport at this location has not been determined. was on the October 1963 Sangre De Christo Mountains World Aeronautical Chart (courtesy of Donald Felton). It was depicted as a private airfield with a 3,600' unpaved runway. 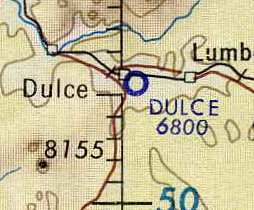 Dulce Airport, as depicted on the January 1966 USAF Operational Navigation Chart (courtesy of Chris Kennedy). described Dulce Airport as having a single 3,200' unpaved Runway 13/31. with a small ramp at the northwest end of the runway. as having a 4,800' paved Runway 15/33. but there was no other sign of any aircraft based at the field. Dulce Airport was listed as being owned by the Jicarilla Apache Tribe in its later years. which was built at some point between 1983-97, at a less constrained site 10 miles south of Dulce. 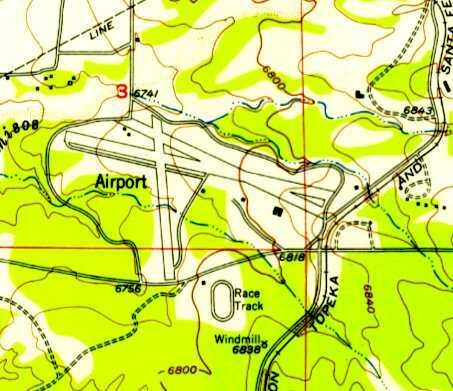 Dulce Airport was still depicted as an active airfield on the 1998 World Aeronautical Chart. 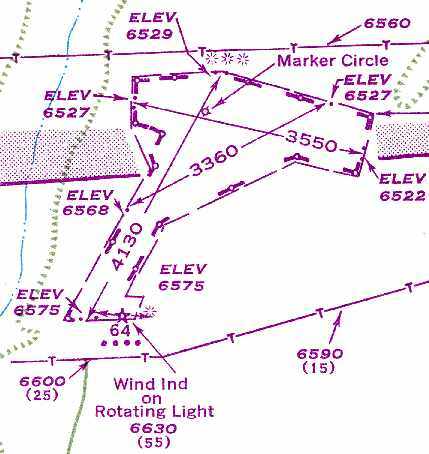 as it was not listed among active airfields in the 2000 AOPA Airport Directory. and I remember there being only one plane, which looked like a dumped Piper Navajo with wheel pants." just east of the hangar. A 7/24/11 aerial view looking south showed the runway pavement all gone, but the orientation of the runway still apparent. A helipad, constructed after the runway's removal, is at the bottom of the photo. The site of Dulce Airport is located southeast of the intersection of Route 64 & Airport Road, appropriately enough.